The present disclosure provides products and methods that provide for the stability of functional amino acids in food matrices. In general, the invention relates to health and nutrition. More specifically, the invention relates to nutritional compositions or products including stable functional amino acid in food matrices and method for preparing the nutritional compositions or products. The invention further provides methods for improving the stability of functional amino acids in food matrices. [00011 本申请为2013年1月3日提交的申请号为PCT/IB2013/050066、发明名称为"用于食物基质中反应性氨基酸的稳定性的组合物和方法"的国际申请的分案申请，该申请于2014 年7月3日进入中国国家阶段，申请号为201380004742.5。 Divisional application [application of Application No. 00011 January 3, 2013, filed as PCT / IB2013 / 050066, entitled "Stability of compositions and methods for food matrix reactive amino acid" in the international application the application on July 3, 2014 to enter the Chinese national phase application No. 201380004742.5. 概括而言，本公开物涉及健康和营养。  In summary, the present disclosure relates to health and nutrition. 更具体而言，本公开物涉及具有食物基质中的稳定化的功能性氨基酸的营养组合物或产品以及其制备方法。 More particularly, the present disclosure relates to a functional food acids have a stabilizing matrix nutritional composition or product as well as methods for their preparation. 还提供了改善食物基质中氨基酸的稳定性的方法。 Also it provided a method for improving the stability of amino acids in the food matrix. 目前市场上存在许多类型的营养组合物。  There are many types of nutritional compositions currently on the market. 基于营养组合物中特定的食物和/或其它成分，营养组合物可靶向于某些人群或消费者群体，例如年轻人、中老年人(elderly)、运动员等。 Based on the nutritional composition of specific foods and / or other ingredients, the nutritional composition may be targeted to certain groups or consumer groups such as the young, the elderly (elderly), and other athletes. 重要的是为参与剧烈的高强度锻炼和每个月训练超过24小时的运动员提供适当的营养。 It is important to provide proper nutrition to participate in intense high-intensity training athletes and more than 24 hours of exercise per month. 实现这一点的一种方式是提供具有某些功能性氨基酸的组合物，所述功能性氨基酸在体内代谢以帮助缓冲肌肉的酸。 One way of achieving this is to provide a composition having certain functionality of amino acid, the functional amino acid metabolism in muscle to help buffer the acid. 实际上，提供具有某些氨基酸的产品将通过缓冲肌肉中积累的酸和延迟肌肉消耗和疲劳而有助于个体练习更长时间、更努力地练习、以高强度练习。 In fact, providing a product with certain amino acids will help individuals exercise longer and harder exercise, high intensity exercise by buffering acid accumulation in muscle and delay muscle wasting and fatigue. 然而，食品中存在氨基酸可能由于多个原因出现问题。  However, problems may arise due to the presence of amino acid food for several reasons. 例如，摄入某些氨基酸可能导致轻度感觉异常(paresthesia)副作用，例如麻刺感、面红、发麻以及鼻和四肢发红。 For example, the intake of certain amino acids may result in minor paresthesia (paresthesia) side effects such as tingling, flushing, tingling and redness of the nose and limbs. 另外，氨基酸一般与还原糖反应，从而生成导致活性化合物褐变和潜在损失的化合物。 Further, amino acids are generally reacted with a reducing sugar, browning and so that the active compound leads to the generation of potential loss. 因此，营养支持的一个目标是为运动员提供满足他们的高密度练习的营养需求、 但不导致不良副作用或活性化合物损失的适宜的营养组合物。  Accordingly, a goal of nutritional support is to provide athletes meet the nutritional needs of their high-density training, but does not lead to an appropriate nutritional composition adverse side effects or loss of the active compound. 提供了营养组合物或产品。  Providing the nutritional composition or product. 还提供了制备所述营养组合物或产品的方法。 Also provides a method of preparing the nutritional composition or product. 还提供了改善食物基质中功能性/反应性氨基酸的稳定性的方法。 Also it provided a method for improving the stability of a food matrix functionality / reactivity of the amino acids. 在一个实施方案中，提供了固体食物产品，其包含葡聚糖类化合物来源和在基本上不含任何还原糖的粘合剂中的反应性氨基酸。 In one embodiment, a solid food product, comprising glucans source compounds and substantially free of reducing sugars any reactive amino acid binder. 在另一个实施方案中，提供了改善固体食物产品中反应性氨基酸的稳定性的方法。  In another embodiment, there is provided a method for improving the stability of the solid food product in the reaction of amino acids. 所述方法包括提供β-葡聚糖类化合物来源、其它固体成分，包括锅巴(rice crisps)、燕麦片、水果片，提供在基本上不含任何还原糖的粘合剂中的反应性氨基酸，和混合所述的β-葡聚糖类化合物来源与所述的在粘合剂中的反应性氨基酸以制成具有改善的反应性氨基酸稳定性的固体食物产品。 The method includes providing a source of compound [beta] glucans, other solid components, comprising a crispy rice (rice crisps), rolled oats, fruit pieces, provided substantially free of any reducing sugars reactive amino acid binder, source β- glucans and mixing the compound with a reactive amino acid in the binder to make a solid food product having improved stability of the reactive amino acids. 在另一个实施方案中，提供了改善固体食物产品中反应性氨基酸的稳定性的方法。  In another embodiment, there is provided a method for improving the stability of the solid food product in the reaction of amino acids. 所述方法包括提供葡聚糖类化合物来源，包括葡聚糖松脆物(crisps)，提供在基本上不含任何还原糖的粘合剂中的反应性氨基酸，和混合所述的β-葡聚糖类化合物来源和所述的在粘合剂中的反应性氨基酸以制成具有改善的反应性氨基酸稳定性的固体食物产品。 The method includes providing a source compounds glucans, including dextran crisps (Crisps), provided substantially free of any reducing sugars reactive amino acid binder, and the mixing β- glucosidase polysaccharides source compounds and the reactive amino acid in a binder to form a solid food product having improved stability of the reactive amino acids. 在另一个实施方案中，提供了改善固体食物产品中反应性氨基酸的稳定性的方法。  In another embodiment, there is provided a method for improving the stability of the solid food product in the reaction of amino acids. 所述方法包括提供β-葡聚糖类化合物来源，包括β-葡聚糖松脆物、其它固体成分，包括锅巴、燕麦片、水果片，提供在基本上不含任何还原糖的粘合剂中的反应性氨基酸，和混合所述的β-葡聚糖类化合物来源与所述的在粘合剂中的反应性氨基酸以制成具有改善的反应性氨基酸稳定性的固体食物产品。 The method includes providing a source of glucans compound [beta], [beta] glucan including crisps, other solid components, comprising a crispy rice, rolled oats, fruit pieces, provided substantially free of any adhesive reducing sugars the reactive amino acid, and source of β- glucans said mixing with said reactive amino acid in a binder to produce a solid food product having improved stability of the reactive amino acids. 在一个实施方案中，所述反应性氨基酸选自丙氨酸、精氨酸、天冬酰胺、天冬氨酸、 瓜氨酸、半胱氨酸、谷氨酸、谷氨酰胺、甘氨酸、组氨酸、羟脯氨酸、羟丝氨酸、羟酪氨酸、羟赖氨酸、异亮氨酸、亮氨酸、赖氨酸、甲硫氨酸、苯丙氨酸、脯氨酸、丝氨酸、牛磺酸、苏氨酸、色氨酸、酪氨酸、缬氨酸或其组合。  In one embodiment, the reactive amino acid selected from alanine, arginine, asparagine, aspartic acid, citrulline, cysteine, glutamic acid, glutamine, glycine, histidine, hydroxyproline, hydroxylysine, serine, hydroxyproline, tyrosine, hydroxylysine, isoleucine, leucine, lysine, methionine, phenylalanine, proline , serine, taurine, threonine, tryptophan, tyrosine, valine, or combinations thereof. 在一个实施方案中，所述反应性氨基酸是丙氨酸。 In one embodiment, the reactive amino acid is alanine. 在另一个实施方案中，提供了制备具有改善的反应性氨基酸稳定性的固体食物产品的方法。  In another embodiment, a method of making a solid food product having improved stability of the reactive amino acids. 所述方法进一步包括其它固体成分，例如锅巴、燕麦片、水果片或其组合。 The method further includes other solid components, e.g. crispy rice, rolled oats, fruit pieces or combinations thereof. 在一个实施方案中，所述固体食物产品在约12个月后具有良好的反应性氨基酸稳定性。  In one embodiment, the solid food product has good stability in reactive amino acid after about 12 months. 在一个实施方案中，β_葡聚糖类化合物来源选自燕麦、燕麦麸、大麦、大麦麸、黑麦、小麦、谷粒(grains)、松脆物或其组合。  In one embodiment, β_ glucans source compound is selected from oats, oat bran, barley, barley bran, rye, wheat, grains (Grains), crisps, or combinations thereof. 在一个实施方案中，β-葡聚糖类化合物来源是燕麦。 In one embodiment, β- glucans oat source compound. 在一个实施方案中，所述固体食物产品是固体食物棒。  In one embodiment, the solid food product is a solid food bar. 一份大小的固体食物棒可以是约30克-约90克。 A size of the solid food bar may be about 30 grams - about 90 grams. 每份大小的固体食物棒可以包含约1.0g_约3.5g所述反应性氨基酸。 Each size of the solid food bar may comprise from about about the 1.0g_ 3.5g reactive amino acid. 在一个实施方案中，每份大小的固体食物棒具有约1.6g所述反应性氨基酸。 In one embodiment, each size of the solid food bar has about 1.6g reactive amino acid. 在一个实施方案中，所述固体食物产品是固体食物棒。  In one embodiment, the solid food product is a solid food bar. 一份大小的固体食物棒可以是约40克-约60克。 A size of the solid food bar may be about 40 grams - about 60 grams. 每份大小的固体食物棒可以包含约1.4g-约1.75g所述反应性氨基酸。 Each size of the solid food bar may comprise from about about the 1.4g- 1.75g ​​reactive amino acid. 在一个实施方案中，每份大小的固体食物棒具有约1.6g所述反应性氨基酸。 In one embodiment, each size of the solid food bar has about 1.6g reactive amino acid. 在一个实施方案中，所述反应性氨基酸是晶体形式的，或者，所述反应性氨基酸可以是粉末形式的。  In one embodiment, the reactive amino acid is the crystalline form, or a reactive amino acid may be in powder form. 在一个实施方案中，所述粘合剂主要由麦芽糖醇糖浆组成。  In one embodiment, the binder consists essentially of a maltitol syrup. 或者，所述粘合剂主要由蔗糖糖浆组成。 Alternatively, the binder consists essentially of a sucrose syrup. 所述粘合剂也可以主要由麦芽糖醇和蔗糖糖浆共混物组成。 The binder may be mainly composed of maltitol and sucrose syrup blends thereof. 在还有另一个实施方案中，提供了固体食物产品，其包含β-葡聚糖类化合物来源和具有在粘合剂中的反应性氨基酸的组合物，所述粘合剂主要由麦芽糖醇糖浆、蔗糖糖浆以及麦芽糖醇和蔗糖糖浆共混物之一组成。  In yet another embodiment, a solid food product, comprising β- glucans and a source of the compound having a reactive amino acid composition in the binder, the binder consists essentially of maltitol syrup, sucrose syrup and maltitol and sucrose syrup one blend composition. 在另一个实施方案中，提供了改善固体食物产品中反应性氨基酸的稳定性的方法。  In another embodiment, there is provided a method for improving the stability of the solid food product in the reaction of amino acids. 所述方法包括提供β-葡聚糖类化合物来源、提供包含在主要由麦芽糖醇糖浆、蔗糖糖浆以及麦芽糖醇和蔗糖糖浆共混物之一组成的粘合剂中的反应性氨基酸的组合物、和混合所述的β-葡聚糖类化合物来源和所述的包含在粘合剂中的反应性氨基酸的组合物以制成具有改善的反应性氨基酸稳定性的固体食物产品。 The method includes providing a source compounds β- glucans, there is provided a composition comprising a reactive amino acid in the binder consists essentially of one of the maltitol syrup, sucrose syrup and maltitol and sucrose syrup consisting of the blend, and β- glucans mixing the source compounds and the binder contained in the amino acid composition of the reaction to make solid food product having improved stability of the reactive amino acids. 在还有另一个实施方案中，提供了制备具有改善的反应性氨基酸稳定性的固体食物产品的方法。  In yet another embodiment, a method of making a solid food product having improved stability of the reactive amino acids. 所述方法包括合并反应性氨基酸与主要由麦芽糖醇糖浆、蔗糖糖浆以及麦芽糖醇和蔗糖糖浆共混物之一组成的粘合剂以形成粘合剂组合物、和混合所述粘合剂组合物与葡聚糖类化合物来源以制成具有改善的反应性氨基酸稳定性的固体食物产品。 The method comprises combining a reactive binder consists essentially of one amino acid with maltitol syrup, sucrose syrup and maltitol and sucrose syrup blend composition to form the adhesive composition, and mixing the binder composition with glucans source compounds to produce solid food product having improved stability of the reactive amino acids. 在一个实施方案中，所述反应性氨基酸选自丙氨酸、精氨酸、天冬酰胺、天冬氨酸、 瓜氨酸、半胱氨酸、谷氨酸、谷氨酰胺、甘氨酸、组氨酸、羟脯氨酸、羟丝氨酸、羟酪氨酸、羟赖氨酸、异亮氨酸、亮氨酸、赖氨酸、甲硫氨酸、苯丙氨酸、脯氨酸、丝氨酸、牛磺酸、苏氨酸、色氨酸、酪氨酸、缬氨酸或其组合。  In one embodiment, the reactive amino acid selected from alanine, arginine, asparagine, aspartic acid, citrulline, cysteine, glutamic acid, glutamine, glycine, histidine, hydroxyproline, hydroxylysine, serine, hydroxyproline, tyrosine, hydroxylysine, isoleucine, leucine, lysine, methionine, phenylalanine, proline , serine, taurine, threonine, tryptophan, tyrosine, valine, or combinations thereof. 在一个实施方案中，所述反应性氨基酸是β-丙氨酸。 In one embodiment, the reactive amino acid is a β- alanine. 在一个实施方案中，β_葡聚糖类化合物来源选自燕麦、燕麦麸、大麦、大麦麸、黑麦、小麦、谷粒、松脆物、水果片或其组合。  In one embodiment, β_ glucans source compound is selected from oats, oat bran, barley, barley bran, rye, wheat, grain, crisps, fruit pieces or combinations thereof. 在一个实施方案中，葡聚糖类化合物来源是燕麦。 In one embodiment, the source compounds are oat glucans. 在一个实施方案中，所述固体食物产品是固体食物棒。  In one embodiment, the solid food product is a solid food bar. 一份大小的固体食物棒可以是约40克-约60克。 A size of the solid food bar may be about 40 grams - about 60 grams. 每份大小的固体食物棒可以具有约1.4g-约1.75g所述反应性氨基酸。 Each size of the solid food bar may have from about to about 1.4g- 1.75g ​​said reactive amino acid. 在一个实施方案中，每份大小的固体食物棒具有约1.6g所述反应性氨基酸。 In one embodiment, each size of the solid food bar has about 1.6g reactive amino acid. 在还有另一个实施方案中，提供了固体食物产品。  In yet another embodiment, a solid food product. 所述固体食物产品包含具有低含量的还原糖的蛋白质来源和在基本上不含任何还原糖的粘合剂中的反应性氨基酸。 The solid food product having a low reducing sugar content comprising a protein source and a reactive amino acid substantially free of any reducing sugars binder. 在另一个实施方案中，提供了改善固体食物产品中反应性氨基酸的稳定性的方法。  In another embodiment, there is provided a method for improving the stability of the solid food product in the reaction of amino acids. 所述方法包括提供具有低含量的还原糖的蛋白质来源、提供在基本上不含任何还原糖的粘合剂中的反应性氨基酸、和混合所述的蛋白质来源与所述的在粘合剂中的反应性氨基酸以制成具有改善的反应性氨基酸稳定性的固体食物产品。 The method includes providing a low content of reducing sugars with protein source, substantially free of any reducing sugars reactive amino acid binder, and mixing the protein source with said binder in reactive amino acid to form a solid food product having improved stability of the reactive amino acids. 在还有另一个实施方案中，提供了制备具有改善的反应性氨基酸稳定性的固体食物产品的方法。  In yet another embodiment, a method of making a solid food product having improved stability of the reactive amino acids. 所述方法包括合并反应性氨基酸与基本上不含任何还原糖的粘合剂以形成粘合剂组合物、和混合所述粘合剂组合物与具有低含量的还原糖的蛋白质来源以制成具有改善的反应性氨基酸稳定性的固体食物产品。 The method comprises combining a reactive source of protein and amino acid substantially free of any reducing sugar to form a sugar binder the binder composition, and mixing the binder composition having a low content to form solid food product having improved stability of the reactive amino acids. 在一个实施方案中，所述固体食物产品在约6个月后具有良好的反应性氨基酸稳定性。  In one embodiment, the solid food product has good stability in reactive amino acid from about 6 months. 在一个实施方案中，所述蛋白质来源是选自以下的来源:基于动物的蛋白质来源、 基于植物的蛋白质来源、基于乳品的蛋白质来源、人造蛋白质来源或其组合。  In one embodiment, the protein source is selected from the following source: animal-based protein sources, plant-based sources of protein, dairy-based sources of protein, an artificial protein source, or a combination thereof. 所述蛋白质可以是酪蛋白f丐、或乳清蛋白质、或大豆蛋白质分离物(soy protein isolate)、或乳蛋白质。 The protein may be casein f Hack, or whey protein, or soy protein isolate (soy protein isolate), or a milk protein. 在一个实施方案中，所述蛋白质来源具有低于约〇. 2 %的乳糖。 In one embodiment, the protein source has a square less than about 2% lactose. 在一个实施方案中，所述蛋白质来源是粉末形式的。  In one embodiment, the protein source powder form. 在一个实施方案中，所述固体食物产品是固体食物棒。  In one embodiment, the solid food product is a solid food bar. 一份大小的固体食物棒可以是约30克-约90克。 A size of the solid food bar may be about 30 grams - about 90 grams. 每份大小的固体食物棒可以具有约1. Og-约3.5g所述反应性氨基酸。 Each size of the solid food bar may have from about 1. Og- to about 3.5g of the reactive amino acid. 在一个实施方案中，每份大小的固体食物棒具有约1.6g所述反应性氨基酸。 In one embodiment, each size of the solid food bar has about 1.6g reactive amino acid. 在还有另一个实施方案中，提供了固体食物产品，其包含具有低含量的还原糖的蛋白质来源和在粘合剂中的反应性氨基酸。  In yet another embodiment, a solid food product comprising a protein source with a low content of reducing sugars and amino acids in the reactive binder. 在还有另一个实施方案中，提供了固体食物产品，其包含具有低含量的还原糖的蛋白质来源和在粘合剂中的反应性氨基酸，所述粘合剂主要由麦芽糖醇糖浆、蔗糖糖浆以及麦芽糖醇和蔗糖糖浆共混物之一组成。  In yet another embodiment, a solid food product comprising a protein source with a low content of reducing sugars and amino acids in the reactive binder, the binder consists essentially maltitol syrup , one of sucrose syrup and maltitol and sucrose syrup blends thereof. 在还有另一个实施方案中，提供了改善固体食物产品中反应性氨基酸的稳定性的方法。  In yet another embodiment, there is provided a method for improving the stability of the solid food product in the reaction of amino acids. 所述方法包括提供具有低含量的还原糖的蛋白质来源、提供在主要由麦芽糖醇糖浆、 蔗糖糖浆以及麦芽糖醇和蔗糖糖浆共混物之一组成的粘合剂中的反应性氨基酸、和混合所述的蛋白质来源与所述的在粘合剂中的反应性氨基酸以制成具有改善的反应性氨基酸稳定性的固体食物产品。 The method includes providing a low content of reducing sugars with protein source, a reactive binder mainly composed of one amino acid maltitol syrup, sucrose syrup and maltitol and sucrose syrup blend composition, and mixing the the source of protein and amino acids in the reactive adhesive is made of a solid food product having improved stability of the reactive amino acids. 在还有另一个实施方案中，提供了制备具有改善的反应性氨基酸稳定性的固体食物产品的方法。  In yet another embodiment, a method of making a solid food product having improved stability of the reactive amino acids. 所述方法包括合并反应性氨基酸与主要由麦芽糖醇糖浆、蔗糖糖浆以及麦芽糖醇和蔗糖糖浆共混物之一组成的粘合剂以形成粘合剂组合物、和混合所述粘合剂组合物与具有低含量的还原糖的蛋白质来源以制成具有改善的反应性氨基酸稳定性的固体食物产品。 The method comprises combining a reactive binder consists essentially of one amino acid with maltitol syrup, sucrose syrup and maltitol and sucrose syrup blend composition to form the adhesive composition, and mixing the binder composition with protein source having a low content of reducing sugar to form a solid food product having improved stability of the reactive amino acids. 在一个实施方案中，所述蛋白质来源是选自以下的来源:基于动物的蛋白质来源、 基于植物的蛋白质来源、基于乳品的蛋白质来源、人造蛋白质来源或其组合。  In one embodiment, the protein source is selected from the following source: animal-based protein sources, plant-based sources of protein, dairy-based sources of protein, an artificial protein source, or a combination thereof. 所述蛋白质可以是酪蛋白钙、或乳清蛋白质、或大豆蛋白质分离物、或乳蛋白质。 The protein may be a calcium caseinate, or whey protein, or soy protein isolate or milk protein. 在一个实施方案中，所述蛋白质来源具有低于约0.2%的乳糖。  In one embodiment, the source of protein having less than about 0.2 percent lactose. 在一个实施方案中，所述固体食物产品是固体食物棒。  In one embodiment, the solid food product is a solid food bar. 一份大小的固体食物棒可以是约30克-约90克。 A size of the solid food bar may be about 30 grams - about 90 grams. 每份大小的固体食物棒可以具有约1.0g_约3.5g所述反应性氨基酸。 Each size of the solid food bar may have from about to about 1.0g_ 3.5g said reactive amino acid. 在一个实施方案中，每份大小的固体食物棒具有约1.6g所述反应性氨基酸。 In one embodiment, each size of the solid food bar has about 1.6g reactive amino acid. 在一个实施方案中，所述固体食物产品是固体食物棒。  In one embodiment, the solid food product is a solid food bar. 一份大小的固体食物棒可以是约40克-约60克。 A size of the solid food bar may be about 40 grams - about 60 grams. 每份大小的固体食物棒可以具有约1.4g-约1.75g所述反应性氨基酸。 Each size of the solid food bar may have from about to about 1.4g- 1.75g ​​said reactive amino acid. 在一个实施方案中，每份大小的固体食物棒包含约1.6g所述反应性氨基酸。 In one embodiment, each size of the solid food bar comprises about 1.6g reactive amino acid. 在另一个实施方案中，提供了液体食物产品，其包含量为约1.0 g -约3.5 g/约200ml -约500ml液体的反应性氨基酸，其中所述液体食物产品具有约3-约5的pH。  In another embodiment, there is provided a liquid food product, comprising an amount of from about 1.0 g - about 3.5 g / about 200ml - 500ml about reactive amino acid liquid, wherein the liquid food product having from about 3 to about the pH 5. 在还有另一个实施方案中，提供了液体食物产品，其包含量为约1.4g-约1.75g/约300ml -约500ml液体的反应性氨基酸，其中所述液体食物产品具有约3-约5的pH。  In yet another embodiment, there is provided a liquid food product, comprising an amount of from about 1.4g- about 1.75g ​​/ about 300ml - 500ml about reactive amino acid liquid, wherein the liquid food product having about 3 - pH of about 5. 在还有另一个实施方案中，提供了改善液体食物产品中反应性氨基酸的稳定性的方法。  In yet another embodiment, there is provided a method for improving the stability of the liquid food product in the reaction of the amino acids. 所述方法包括溶解约1.4g-约1.75g反应性氨基酸/约300ml -约500ml液体以制成具有改善的反应性氨基酸稳定性的液体食物产品，其中所述液体食物产品具有约3-约5的pH。 The method comprises dissolving from about 1.75g ​​to about 1.4g- reactive amino acid / about 300ml - 500ml liquid is made about a liquid food product having improved stability of the reactive amino acid, wherein the liquid food product having from about 3 to about 5 the pH. 在另一个实施方案中，提供了液体食物产品，其包含量为约1.0g-约3.5g/约200ml -约500ml液体的反应性氨基酸，其中所述液体食物产品具有约3-约5的pH。  In another embodiment, there is provided a liquid food product, comprising an amount of from about 1.0g- about 3.5g / about 200ml - 500ml about reactive amino acid liquid, wherein the liquid food product having from about 3 to about the pH 5. 在还有另一个实施方案中，提供了制备具有改善的反应性氨基酸稳定性的液体食物产品的方法。  In yet another embodiment, there is provided a method of preparing a liquid food product having improved stability of the reactive amino acids. 所述方法包括溶解约1.4g-约1.75g反应性氨基酸/约300ml-约500ml液体以制成具有改善的反应性氨基酸稳定性的液体食物产品，其中所述液体食物产品具有约3-约5 的pH。 The method comprises dissolving from about 1.75g ​​to about 1.4g- reactive amino acid / about 500ml to about 300ml- liquid to make a liquid food product having improved stability of the reactive amino acid, wherein the liquid food product having from about 3 to about 5 the pH. 在还有另一个实施方案中，提供了制备具有改善的反应性氨基酸稳定性的液体食物产品的方法。  In yet another embodiment, there is provided a method of preparing a liquid food product having improved stability of the reactive amino acids. 所述方法包括溶解约1. 〇g_约3.5g反应性氨基酸/约200ml-约500ml液体以制成具有改善的反应性氨基酸稳定性的液体食物产品，其中所述液体食物产品具有约3-约5 的pH。 The method comprises dissolving from about 1 to about 〇g_ reactive amino acid 3.5g / 500ml to about about 200ml- liquid to make a liquid food product having improved stability of the reactive amino acid, wherein the liquid food product having from about 3 a pH of about 5. [0061 ]在一个实施方案中，在将所述液体食物产品在约70 °C -约90 °C的温度下加热约45 分钟-约75分钟的时间期限后所述液体食物产品具有良好的反应性氨基酸稳定性。  In one embodiment, in the liquid food product at about 70 ° C - about 45 minutes was heated at a temperature of about to 90 ° C - about 75 minutes after the time period of the liquid food product has a good response amino acid stability. 在一个实施方案中，在将所述液体食物产品在约80°C的温度下加热约60分钟的时间期限后所述液体食物产品具有良好的反应性氨基酸稳定性。 In one embodiment, the food product liquid after the heating time period of about 60 minutes at a temperature of about to 80 ° C the liquid food product has a good stability of reactive amino acid. 在一个实施方案中，所述反应性氨基酸以约1.6g的量存在。  In one embodiment, the reactive amino acid is present in an amount of about 1.6g. 在一个实施方案中，提供了每400ml液体的反应性氨基酸。  In one embodiment, a reactive amino acid per 400ml of liquid. 在一个实施方案中，所述液体食物产品的pH为约4。  In one embodiment, pH of the liquid food product is about 4. 在一个实施方案中，所述液体食物产品是即饮型(ready-to-drink)组合物。  In one embodiment, the liquid food product is a ready to drink (ready-to-drink) composition. 在还有另一个实施方案中，提供了液体食物产品，其包含量为约5g_约6.5g/约100ml-约300ml液体的反应性氨基酸，其中所述液体食物产品具有约3-约5的pH。  In yet another embodiment, there is provided a liquid food product, comprising an amount of from about 5g_ about 6.5g / about 300ml of about 100ml- reactive amino acid liquid, wherein the liquid food product having from about 3 a pH of about 5. 在还有另一个实施方案中，提供了改善液体食物产品中反应性氨基酸的稳定性的方法。  In yet another embodiment, there is provided a method for improving the stability of the liquid food product in the reaction of the amino acids. 所述方法包括溶解约5g_约6.5g反应性氨基酸/约100ml-约300ml液体以制成具有改善的反应性氨基酸稳定性的液体食物产品，其中所述液体食物产品具有约3-约5的pH。 The method comprises dissolving from about 6.5g to about 5g_ reactive amino acid / about 300ml to about 100ml- liquid to make amino acid having improved stability of the reactive liquid food product, wherein the liquid food product having from about 3 to about 5 pH. 在另一个实施方案中，提供了制备具有改善的反应性氨基酸稳定性的液体食物产品的方法。  In another embodiment, there is provided a method of preparing a liquid food product having improved stability of the reactive amino acids. 所述方法包括溶解约5g_约6.5g反应性氨基酸/约100ml-约300ml液体以制成具有改善的反应性氨基酸稳定性的液体食物产品，其中所述液体食物产品具有约3-约5的pH。 The method comprises dissolving from about 6.5g to about 5g_ reactive amino acid / about 300ml to about 100ml- liquid to make amino acid having improved stability of the reactive liquid food product, wherein the liquid food product having from about 3 to about 5 pH. 在一个实施方案中，所述反应性氨基酸选自丙氨酸、精氨酸、天冬酰胺、天冬氨酸、 瓜氨酸、半胱氨酸、谷氨酸、谷氨酰胺、甘氨酸、组氨酸、羟脯氨酸、羟丝氨酸、羟酪氨酸、羟赖氨酸、异亮氨酸、亮氨酸、赖氨酸、甲硫氨酸、苯丙氨酸、脯氨酸、丝氨酸、牛磺酸、苏氨酸、色氨酸、酪氨酸、缬氨酸或其组合。  In one embodiment, the reactive amino acid selected from alanine, arginine, asparagine, aspartic acid, citrulline, cysteine, glutamic acid, glutamine, glycine, histidine, hydroxyproline, hydroxylysine, serine, hydroxyproline, tyrosine, hydroxylysine, isoleucine, leucine, lysine, methionine, phenylalanine, proline , serine, taurine, threonine, tryptophan, tyrosine, valine, or combinations thereof. 在一个实施方案中，所述反应性氨基酸是肌肽。 In one embodiment, the reactive amino acid is carnosine. 在一个实施方案中，所述反应性氨基酸以约5.7g的量存在。  In one embodiment, the reactive amino acid is present in an amount of about 5.7g. 在一个实施方案中，提供了每约200ml液体的反应性氨基酸。  In one embodiment, a reactive amino acid per about 200ml of liquid. 在一个实施方案中，所述液体食物产品是即饮型组合物。  In one embodiment, the liquid food product is a ready to drink composition. 本公开物的优点是提供了改善的营养产品和组合物。 Advantage of  the present disclosure is to provide improved nutritional products and compositions. 本公开物的另一个优点是提供了具有改善的氨基酸稳定性的食物产品。  Another advantage of the present disclosure is to provide a food product having improved stability of the amino acid. 本公开物的还有另一个优点是提供了具有氨基酸的、但不导致感觉异常副作用的食物产品。  Yet another object of the present disclosure is to provide the advantage of having the amino acid, but does not cause side effects paresthesia food product. 本公开物的还有另一个优点是提供了具有对美拉德反应敏感性较低的氨基酸的食物产品。  The present disclosure has another advantage is to provide a food product having the amino acid Maillard reaction is less sensitive. 本公开物的另一个优点是提供了在食物基质中稳定化的功能性氨基酸。  Another advantage of the present disclosure is to provide a food matrix in the function of stabilizing amino acids. 本公开物的还有另一个优点是提供了能将具有肌肉缓冲作用的功能性氨基酸递送给运动员的产品。  Yet another advantage of the present disclosure is to provide a muscle capable of having a buffering action of the acid functional product delivered to players. 另外的特征和优点如本文所述，并且根据下面的详述和附图其将是显而易见的。  Additional features and advantages are described herein, and from the following detailed description and accompanying drawings it will be apparent. 图1给出了分别在4°C、20°C和30°C下贮存3个月后每份大小包含1.6gi3_丙氨酸的3 种食物广品。  FIG. 1 shows the kinds of food are stored for 3 months after the product 3 wide size each comprising 1.6gi3_ alanine at 4 ° C, 20 ° C and 30 ° C.
 图2给出了图1的食物产品在不同贮存期限条件下的平均β-丙氨酸百分比回收率。  FIG. 2 shows the food product of FIG. 1 β- alanine average percent recovery period under different storage conditions. 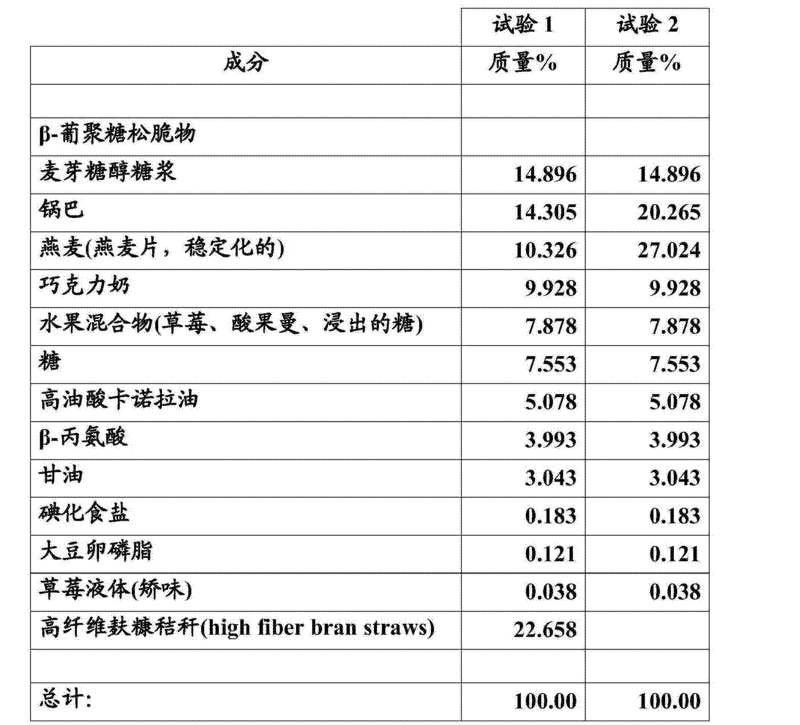 图3给出了具有减少的量的还原糖的食物产品。  Figure 3 shows a food product having a reduced amount of reducing sugars. 图4给出了在20°C和30°C下贮存期间具有减少的还原糖的食物产品中的β_丙氨酸浓度。  FIG. 4 shows the concentration of alanine β_ food product having a reduced sugar at 20 ° C and 30 ° C during storage of. 图5给出了含有1.6gi3_丙氨酸并各自含有不同的β-葡聚糖类化合物来源的食物产品。  Figure 5 shows a food product containing 1.6gi3_ and alanine, each containing a different source of β- glucans. 图6给出了含有1.6gi3_丙氨酸并且各自含有不同的β-葡聚糖类化合物来源的食物产品。  FIG. 6 shows the food product containing 1.6gi3_ alanine and each containing different sources of β- glucans. 图7给出了在不同温度下贮存1个月后包含β-丙氨酸和麦芽糖醇或蔗糖糖浆粘合剂的不同食物产品。  Figure 7 shows stored at different temperatures for one month after alanine and β- comprising maltitol or sucrose syrup binders different food products. 图8给出了在不同温度下贮存6个月后包含β-丙氨酸、麦芽糖醇或蔗糖糖浆粘合剂和低含量的乳糖蛋白质成分的不同食物产品。  FIG. 8 shows stored at different temperatures after 6 months comprising β- alanine, different food products of protein components lactose sucrose syrup or maltitol and a low content of binder. 图9给出了在不同温度下贮存6个月后含有麦芽糖醇或蔗糖糖浆粘合剂和低含量乳糖蛋白质成分的蛋白质棒中的平均丙氨酸百分比回收率。  FIG. 9 shows the average percent recovery alanine after 6 months of storage at different temperatures, or protein bars sucrose syrup containing maltitol binder and a low content of lactose in the protein component. [0091 ]图10给出了在约80°C下加热1小时后饮料中的β_丙氨酸回收率。  Figure 10 shows the recovery of beverage β_ alanine heated at approximately 80 ° C 1 hour. 除非上下文另有清楚的规定，否则本文所用的单数形式"一个"、"一种"和"所述的"或"该"包括指示对象的复数。  Unless the context clearly dictates otherwise As used herein, the singular forms "a", "an" and "the" or "the" include plural referents object. 因此，例如，对"一种多肽"的提及包括两种或更多种多肽的混合物等。 Thus, for example, reference to "a polypeptide" includes a mixture of two or more polypeptides, and the like. 本文所用的"约"应理解为是指数值范围中的数值。  As used herein, "about" is understood to be the value of the index value range. 此外，本文中的所有数值范围都应理解为包括该范围内的所有整数、整体或分数。 Moreover, all numerical ranges herein should be understood to include all integers, integers or fractions within the range. 本文所用的术语"氨基酸"应理解为包括一种或多种氨基酸。  As used herein, the term "amino acid" is understood to include one or more amino acids. 氨基酸可以是例如丙氨酸、精氨酸、天冬酰胺、天冬氨酸、瓜氨酸、半胱氨酸、谷氨酸、谷氨酰胺、甘氨酸、组氨酸、 羟脯氨酸、羟丝氨酸、羟酪氨酸、羟赖氨酸、异亮氨酸、亮氨酸、赖氨酸、甲硫氨酸、苯丙氨酸、 脯氨酸、丝氨酸、牛磺酸、苏氨酸、色氨酸、酪氨酸、缬氨酸或其组合。 Amino acid can be, for example, alanine, arginine, asparagine, aspartic acid, citrulline, cysteine, glutamic acid, glutamine, glycine, histidine, hydroxyproline, hydroxylysine serine, hydroxyproline, tyrosine, hydroxylysine, isoleucine, leucine, lysine, methionine, phenylalanine, proline, serine, taurine, threonine, color threonine, tyrosine, valine, or combinations thereof. 本文所用的术语"抗氧化剂"应理解为包括任意一种或多种抑制氧化或由活性氧种类(Reactive Oxygen Species，"R0S"）及其它自由基和非自由基种类促进的反应的不同物质，例如胡萝卜素(维生素A前体）、维生素C、维生素E和硒。  As used herein, the term "antioxidant" is understood to include any one or more substances that inhibit oxidation or by a reactive oxygen species (Reactive Oxygen Species, "R0S") and other free radicals and non-radical reactions promoted type of different materials, e.g. carotene (a vitamin A precursor), vitamin C, vitamin E and selenium. 另外，抗氧化剂是能减慢或防止其它分子氧化的分子。 Moreover, antioxidants are molecules able to slow or prevent the oxidation of other molecules. 抗氧化剂的非限制性实例包括类胡萝卜素、辅酶Q10("C〇Q10"）、类黄酮、谷胱甘肽、Goji(枸杞属）、橙皮苷、lactowolfberry、木酸素、叶黄素、番前红素、多酸、 硒、维生素A、维生素Βι、维生素B6、维生素Bi2、维生素C、维生素D、维生素E、玉米黄质或其组合。 Non-limiting examples of antioxidants include carotenoids, coenzyme QlO ( "C〇Q10"), flavonoids, glutathione, Goji (wolfberry), hesperidin, lactowolfberry, wood acid, lutein, lycopene before the red pigment, acid, selenium, vitamin A, vitamin Βι, vitamin B6, vitamin of Bi2, vitamin C, vitamin D, vitamin E, zeaxanthin, or combinations thereof. 本文所用的"碳水化合物"的含义包括:单糖，其包括丙糖(例如:酮丙糖(二羟基丙酮）；丙醛糖(甘油醛））；丁糖，其包括:酮丁糖(例如:赤藓酮糖)和丁醛糖(例如:赤藓糖、苏糖）；戊糖，其包括:戊酮糖(例如:核酮糖、木酮糖）、戊醛糖(例如：核糖、阿拉伯糖、木糖、来苏糖）、脱氧糖(例如:脱氧核糖）；己糖，其包括:己酮糖(例如:阿洛酮糖、果糖、山梨糖、塔格糖）、己醛糖(例如:阿洛糖、阿卓糖、葡萄糖、甘露糖、古洛糖、艾杜糖、半乳糖、塔罗糖）、脱氧糖(例如:岩藻糖、墨角藻糖(Fuculose)、鼠李糖）；庚糖(例如:景天庚醛糖）；辛糖;壬糖(例如：甘露糖胺丙酮酸）；二糖，其包括：蔗糖；乳糖；麦芽糖；海藻糖；土冉糖；纤维素二糖； kojiboise;黑曲霉二糖；异麦芽糖；和异麦芽酮糖;三糖，其包括:松三糖;和麦芽三糖;寡糖，其包括:玉米糖浆和麦  As used herein, "carbohydrate" is meant to include: monosaccharides, including a triose (for example: one triose (dihydroxyacetone); aldotriose (glyceraldehyde)); tetroses, comprising: ketotetrose sugars (e.g. : erythrulose) and butyraldehyde sugars (e.g. : erythrose, threose); pentoses, comprising: ketopentoses (e.g. : ribulose, xylulose), aldopentoses (e.g. : ribose, arabinose, xylose, lyxose), deoxy sugars (e.g. : deoxyribose); hexoses, comprising: ketohexoses (for example: psicose, fructose, sorbose, tagatose), aldohexose (e.g. : allose, altrose, glucose, mannose, gulose, idose, galactose, talose), deoxy sugars (e.g. : fucose, fucose (fuculose ), rhamnose); heptose (e.g. : sedoheptulose aldose); octose; nonose (e.g. : mannosamine pyruvic acid); disaccharides, comprising: sucrose; lactose; maltose; trehalose; soil Ran sugar; cellobiose; kojiboise; Aspergillus niger disaccharides; isomaltose; and isomaltulose; trisaccharides, comprising: melezitose; and maltotriose; oligosaccharide, comprising: wheat and corn syrup 糖糊精;和多糖，其包括:葡聚糖(例如糊精、右旋糖酐、葡聚糖）、糖原、甘露聚糖、半乳聚糖和淀粉(例如来自玉米、小麦的淀粉、木薯淀粉、来自稻和马铃薯的淀粉，包括直链淀粉和支链淀粉。所述淀粉可以是天然的或改性的或凝胶化的）；或其组合。 Sugar, dextrin; and polysaccharides, comprising: dextran (e.g. dextrin, dextran, dextran), glycogen, mannan, galactan, and starch (e.g. starch, tapioca starch from corn, wheat, from rice and potato starches, amylose and amylopectin of the starch may be natural or modified or gelled);., or combinations thereof. 碳水化合物还包括甜味剂来源，例如蜂蜜、槭糖浆、葡萄糖(右旋糖）、玉米糖浆、固体玉米糖衆、高果糖糖衆、结晶果糖、果汁浓缩物和结晶果汁(crystal 1 ine juice)。 Further comprising a sweetener carbohydrate sources, such as honey, maple syrup, glucose (dextrose), corn syrup, corn sugar solids all, all the high fructose sugar, crystalline fructose, fruit juice concentrate and crystallization (crystal 1 ine juice) . 本文所用的"食品级微生物"意指用在食品中的并且通常被认为用在食品中是安全的微生物。  As used herein, "food-grade microorganism" is meant for use in food and is generally considered to be safe for use in food microorganisms. 虽然术语"个体"和"患者"在本文中常用于指人，但本发明并不限于此。  Although the terms "subject" and "patient" are often used herein to refer to people, but the present invention is not limited thereto. 因此，术语"个体"和"患者"指患有能从治疗中受益的医学病症或处于所述医学病症风险中的任何动物、哺乳动物或人。 Thus, the term "individual" and "patient" refer to those who benefit from the treatment of a medical condition or is in any animal, mammal or human risk of the medical condition. 本文所用的ω -3脂肪酸例如α-亚麻酸（"ALA"）、二十二碳六烯酸（"DHA"）和二十碳五烯酸（"EPA"）的来源的非限制性实例包括鱼油、磷虾、家禽、蛋或其它植物或坚果来源例如亚麻籽、核桃、杏仁、藻、改良的植物等。 Non-limiting sources  ω -3 fatty acids, for example, as used herein, α- linolenic acid ( "ALA"), docosahexaenoic acid ( "DHA") and eicosapentaenoic acid ( "EPA") of examples include fish, krill, poultry, eggs, or other plant sources such as linseed or nut, walnut, almond, alginate, modified plants. 术语"微生物"包括细菌、酵母和/或真菌、具有微生物的细胞生长培养基或其中培养了微生物的细胞生长培养基。  The term "microorganism" includes bacteria, yeast and / or fungi growth medium with a microorganism or cell culture wherein the cell growth medium of the microorganism. 本文所用的术语"矿物质"应当理解为包括硼、钙、铬、铜、碘、铁、镁、锰、钼、镍、磷、 钾、硒、硅、锡、钒、锌或其组合。  As used herein, the term "minerals" should be understood to include boron, calcium, chromium, copper, iodine, iron, magnesium, manganese, molybdenum, nickel, phosphorus, potassium, selenium, silicon, tin, vanadium, zinc, or combination. 本文所用的"非复制性的"微生物意指通过经典的平板接种方法不能检测到活的细胞和/或菌落形成单位。  As used herein, "non-replicating" means that the microorganism can not be detected by classical plating methods into living cells and / or colony forming units. 所述经典的平板接种方法总结在微生物学书籍中：James Monroe Jay等人，"Modern food microbiology"，第7版，Springer Science,New York,NYp790 (2005)。 The classical plating methods are summarized in the microbiology book: James Monroe Jay, et al., "Modern food microbiology", 7th edition, Springer Science, New York, NYp790 (2005). 典型地，不存在活的细胞可如下证明：在接种不同浓度的细菌制品（'非复制性'样品）并在适宜的条件下孵育（需氧和/或厌氧气氛达至少24h)后在琼脂板上无可见菌落或在液体生长培养基中无浊度增加。 Typically, the absence of living cells can be demonstrated as follows: after inoculation with different concentrations of bacterial preparations ( 'non-replicating' samples) and incubated (aerobic and / or anaerobic atmosphere for at least 24h) under suitable conditions in agar plate no visible colonies or no increase in haze in liquid growth medium. 例如，可通过热处理、特别是低温/长时间热处理使得双歧杆菌属（bifidobacteria)如长双歧杆菌（Bifidobacterium longum)、乳双歧杆菌(Bifidobacterium lactis)和短双歧杆（Bifidobacterium breve)或乳杆菌属(lactobacillus)如副干酪乳杆菌（Lactobacillus paracasei)或鼠李糖乳杆菌(Lactobacillus rhamnosus)是非复制性的。 For example, by heat treatment, especially low temperature / long time heat treatment such that the genus Bifidobacterium (bifidobacteria) as Bifidobacterium longum (Bifidobacterium longum), Bifidobacterium (Bifidobacterium lactis) and short Bifidobacterium (Bifidobacterium breve) or milk genus (Lactobacillus), such as Lactobacillus paracasei (Lactobacillus paracasei), or Lactobacillus rhamnosus (Lactobacillus rhamnosus) is non-replicating. 本文所用的"核苷酸"应理解为脱氧核糖核酸（"DNA"）或核糖核酸（"RNA"）的亚基。  As used herein, "nucleotide" is understood as deoxyribonucleic acid ( "the DNA") or ribonucleic acid ( "an RNA") subunit. 其是由含氮碱基、磷酸分子和糖分子(在DNA中是脱氧核糖，在RNA中是核糖)组成的有机化合物。 Which it is a nitrogenous base, a phosphate molecule, and a sugar molecule (deoxyribose in DNA, ribose in RNA) composed of an organic compound. 各核苷酸单体(单个单元)连接在一起形成聚合物或长链。 Each nucleotide monomers (single units) linked together to form long chains or polymers. 外源性核苷酸特别地由饮食补充来提供。 The exogenous nucleotide specifically provided by dietary supplements. 外源性核苷酸可以为单体形式，例如5 腺苷一磷酸（"5 ' -AMP"）、5 鸟苷一磷酸（"5 ' -GMP"）、5 ' -胞嘧啶一磷酸（"5 ' -CMP"）、5 ' -尿嘧啶一磷酸（"5 ' -UMP"）、5 ' -肌苷一磷酸（"5'-頂P"）、5'_胸腺嘧啶一磷酸（"5'-TMP"）或其组合。 Exogenous nucleotide monomeric form may be, for example, 5 adenosine monophosphate ( "5 '-AMP"), 5 guanosine monophosphate ( "5' -GMP"), 5 '- cytosine monophosphate ( " 5 '-CMP "), 5' - monophosphate uracil (" 5 '-UMP "), 5' - inosine monophosphate (" 5'top P "), 5'_ thymidine monophosphate (" 5 '-TMP "), or combinations thereof. 外源性核苷酸也可以为聚合形式，例如完整的RNA。 The exogenous nucleotide RNA may be complete, for example, a polymeric form. 可以存在多种聚合形式的来源，例如酵母RNA。 There may be various sources polymerized form, such as yeast RNA. 本文所用的"营养组合物"或"营养产品"应理解为包含任何量的有益健康的食物成分和可能任选的另外的成分，其基于产品中的功能需求并且完全符合所有适用的条例。  As used herein, "nutritional composition" or "nutritional product" is understood to healthy food ingredients and optionally additional ingredients may comprise any amounts based on the functional requirements of the product and in full compliance with all applicable regulations. 任选的成分可包括但不限于常规的食品添加剂，例如一种或多种酸化剂、另外的增稠剂、缓冲剂或P Η调节剂、螯合剂、着色剂、乳化剂、赋形剂、矫味剂、矿物质、等渗剂（〇sm 〇tic agent)、药学上可接受的载体、防腐剂、稳定剂、糖、甜味剂、组织形成剂和/或维生素。 Optional ingredients can include, but are not limited to, conventional food additives, such as one or more acidifying agents, additional thickeners, buffers or P Η adjusting agents, chelating agents, colorants, emulsifiers, excipients, flavoring agents, minerals, isotonic agents (〇sm 〇tic agent), pharmaceutically acceptable carriers, preservatives, stabilizing agents, sugars, sweeteners, texturizing agents, and / or vitamins. 任选的成分可以以任何适合的量被加入。 The optional ingredients may be added in any suitable amount. vi)其它有机酸，其包括草酸、植酸(肌醇六磷酸（inositol hexaphosphate));酒石酸;和漆树酸;或 vii)其组合。  vi) other organic acid include oxalic acid, phytic acid (phytate (inositol hexaphosphate)); tartaric acid; and anacardic acid; or  vii) combinations thereof. 本文所用的"益生元"是选择性地促进有益细菌的生长或抑制肠内病原菌的生长或粘膜附着的食物物质。  As used herein, "prebiotic" is selectively promote the growth of beneficial bacteria or inhibit the growth of pathogenic intestinal food substance or mucosal adhesion. 它们不在摄取它们的人的胃和/或肠上段中灭活或在胃肠道中被吸收，但是它们被胃肠微生物系统和/或被益生菌发酵。 They are not in their intake of the human stomach and / or deactivation and absorption in the gastrointestinal tract or in the gut, but they are fermented by the gastrointestinal microflora system and / or probiotics. 益生元例如如Glenn R.Gibson和Marcel B.Roberfroid, "人集落微生物的饮食调节：引入益生元概念(Dietary Modulation of the Human Colonic Microbiota: Introducing the Concept of Prebiotics)''， J.Nutr. 1995125:1401-1412中所定义。益生元的非限制性实例包括阿拉伯胶、α葡聚糖、阿拉伯半乳聚糖、β葡聚糖、右旋糖苷、低聚果糖、岩藻糖基乳糖、低聚半乳糖、半乳甘露聚糖、 低聚龙胆糖、低聚葡萄糖(@111(30〇118〇83〇(31^1^(16)、瓜尔胶、菊粉、低聚异麦芽糖、乳糖新四糖（]^〇1：01160丨61^3086)、低聚乳果糖（13〇1：0811〇1'086)、乳果糖、果聚糖、麦芽糖糊精、乳低聚糖、部分水解的瓜尔胶、果胶低聚糖化6〇1：；[00118083001^14(16)、抗性淀粉、回生淀粉(retrograded starch)、唾液低聚糖（sialooligosaccharide)、唾液酸乳糖(sialyllactose)、大豆低聚糖（soyoligosaccharide)、糖醇、低聚木糖、或它们的水解物、 或其 Prebiotics such as e.g. Glenn R.Gibson and Marcel B.Roberfroid, "human dietary adjustments microorganism colonies: introducing the concept of prebiotics (Dietary Modulation of the Human Colonic Microbiota: Introducing the Concept of Prebiotics) '', J.Nutr 1995125.: 1401-1412 as defined above. non-limiting examples of prebiotics include gum arabic, [alpha] dextran, arabinogalactan, beta] glucan, dextran, oligofructose, fucosyl lactose, oligo galactose, galactomannans, gentiooligosaccharides, glucooligosaccharides (@ 111 (30〇118〇83〇 (31 ^ 1 ^ (16), guar gum, inulin, isomalt, lactose, neotetraose (] ^ 〇1: 01,160 Shu 61 ^ 3086), lactosucrose (13〇1: 0811〇1'086), lactulose, levan, maltodextrins, milk oligosaccharides, partially hydrolyzed guar gum, pectin oligo- 6〇1:; [00118083001 ^ 14 (16), resistant starches, retrograded starch (retrograded starch), saliva oligosaccharides (sialooligosaccharide), sialyllactose (sialyllactose), soybean oligosaccharides (soyoligosaccharide), sugar alcohols, xylo-oligosaccharides, or hydrolyzate thereof, or 合。 Co.
本文所用的益生菌微生物（下文称为"益生菌"）是食品级微生物(活的，包括半活力的或弱化的、和/或非复制性的）、代谢物、微生物细胞制品或微生物细胞的组分，当以适当的量施用时其能赋予宿主健康益处，更特定地，其通过改善其肠微生物平衡而有益地影响宿主，从而导致对宿主的健康或良好状态产生作用。  As used herein, probiotic microorganisms (hereinafter "probiotics") is a food grade microorganisms (alive, including semi-viable or weakened, and / or non-replicating), metabolites, microbial cell preparations or components of microbial cells, when administered in adequate amounts which confer a health benefit on the host, more particularly, it beneficially affects the host by improving its intestinal microbial balance, leading to an effect on the health or well-being of the host. 参见Salminen S，Ouwehand A.Benno Υ·等人，"益生菌：应当如何定义它们？（Probiotics:how should they be defined? )"， Trends Food Sci.Technol. ,1999:10,107-10。 See, Salminen S, Ouwehand A.Benno Υ · et al "Probiotics: how should define them? (Probiotics: how should they be defined? )", Trends Food Sci.Technol, 1999:. 10,107-10. 一般而言，认为这些微生物抑制或影响肠道内病原菌的生长和/或代谢。 Generally, these microorganisms that inhibit or influence the growth of intestinal pathogens and / or metabolism. 益生菌也可以激活宿主的免疫功能。 Probiotics can also activate the host's immune function. 为此，已经有许多不同的将益生菌包含在食物产品中的方法。 To this end, there have been a number of different methods will be included in the probiotic food products. 益生菌的非限制性实例包括气球菌属(Aerococcus)、 曲霉属(Aspergillus)、芽孢杆菌属（Bacillus)、拟杆菌属（Bacteroides)、双歧杆菌属(Bifidobacterium)、假丝酵母属（Candida )、梭菌属（Clostridium)、德巴利酵母属(Debaromyces)、肠球菌属（Enterococcus)、梭杆菌属（Fusobacterium)、乳杆菌属(Lactobacillus)、乳球菌属（Lactococcus)、明串珠菌属（Leuconostoc)、蜜蜂球菌属(Melissococcus)、微球菌属(Micrococcus)、毛霉属(Mucor)、酒球菌属(Oenococcus)、片球菌属(Pediococcus)、青霉属(PeniciIlium)、消化链球菌属(Peptostrepococcus)、毕赤酵母属(Pichia)、丙酸杆菌属(Propionibacterium)、假链状菌属(Pseudocatenulatum)、根霉属（Rhizopus)、酵母属（Saccharomyces)、葡萄球菌属（Staphylococcus)、链球菌属(Streptococcus)、球拟酵母属(Torulopsis)、魏斯氏菌属(Weissella)或其组合。 Non-limiting examples of probiotics include Aerococcus (Aerococcus), Aspergillus (Aspergillus), Bacillus (Bacillus), Bacteroides genus (Bacteroides), the genus Bifidobacterium (Bifidobacterium), Candida (Candida) , Clostridium (Clostridium), Debaryomyces (Debaromyces), Enterococcus (of Enterococcus), Fusobacterium (Fusobacterium), Lactobacillus (Lactobacillus), Lactococcus (Lactococcus), Leuconostoc ( Leuconostoc), bees Lactococcus (Melissococcus), Micrococcus (Micrococcus), Mucor (Mucor), Oenococcus (Oenococcus), Pediococcus (Pediococcus), Penicillium (PeniciIlium), Peptostreptococcus ( Peptostrepococcus), Pichia (Pichia), Propionibacterium (Propionibacterium), pseudocatenulatum species (pseudocatenulatum), Rhizopus (Rhizopus), Saccharomyces (Saccharomyces), Staphylococcus (Staphylococcus), Streptococcus genus (Streptococcus), Torulopsis (Torulopsis), Weissella (Weissella) or combinations thereof. 本文所用的术语"蛋白质"、"肽"、"寡肽"或"多肽"应理解为指包含单个氨基酸(单体）、通过肽键结合在一起的两个或更多个氨基酸(二肽、三肽或多肽）、胶原蛋白、其前体、 同系物、类似物、拟拟物、盐、前药、代谢物或片段、或其组合的任意组合物。  As used herein, the term "protein", "peptide", "oligopeptide" or "polypeptide" is understood to mean containing a single amino acid (monomer), joined together by peptide bonds two or more amino acids ( dipeptide, tripeptide or polypeptide), collagen precursor, homologs, analogs, to be intended, salt, prodrug, metabolite or fragment thereof, or any combination of the composition. 在此澄清，除非另有说明，否则以上术语中的任意一个的使用可以互换。 In this clarification, unless otherwise specified, any of the above terms of a use interchangeable. 应当理解的是，多肽(或肽或蛋白质或寡肽)常含有通常被称为20种天然存在的氨基酸的20种氨基酸以外的氨基酸，并且在给定的多肽中许多氨基酸(包括末端氨基酸)可以通过天然过程如糖基化及其它翻译后修饰或者通过本领域公知的化学修饰技术而被修饰。 It will be appreciated that the polypeptides (or peptides or proteins or oligopeptides) often contain amino acids other than commonly referred to as the 20 naturally occurring amino acids of 20 kinds, and many of a given amino acid polypeptide (including the terminal amino acids) can by natural processes such as glycosylation and other post-translational modifications, or be modified by known in the art of chemical modification techniques. 本发明的多肽中可以存在的已知修饰包括但不限于乙酰化、酰基化、ADP-核糖基化、酰胺化、类黄烷或血红素部分的共价连接、多核苷酸或多核苷酸衍生物的共价连接、脂质或脂质衍生物的共价连接、磷脂酰肌醇的共价连接、交联、环化、二硫键形成、脱甲基化、共价交联的形成、胱氨酸的形成、焦谷氨酸盐的形成、甲酰化、γ -羧化、糖化、糖基化、糖基磷脂酰肌醇（"GPI"）膜锚着点形成、羟基化、碘化、 甲基化、肉豆蔻酰化、氧化、蛋白酶解加工、磷酸化、异戊二烯化、消旋化、硒酰化(861611〇7131：；[011)、硫酸盐化(811]^31：；[011)、转移-1?嫩介导的向多肽中加入氨基酸如精氨酰化和遍在蛋白化。 Polypeptides of the invention may be present in known modifications include but are not limited to, acetylation, acylation, ADP-ribosylation, amidation, covalent flavanoid or a heme moiety, a polynucleotide or polynucleotide derivative covalent thereof, covalent attachment of a lipid or lipid derivative, covalent attachment of phosphatidylinositol, cross-linking, cyclization, disulfide bond formation, demethylation, formation of covalent cross-linking, formation of cystine, formation of pyroglutamate, formylation, γ - carboxylation, glycation, glycosylation, glycosyl phosphatidyl inositol ( "GPI") membrane anchor formation, hydroxylation, iodine , methylation, myristoylation, oxidation, proteolytic processing, phosphorylation, prenylation, racemization, selenoylation acylation (861611〇7131:; [011), sulfation (811] ^ 31:; [011), transfer mediated -1 tender added protein amino acid such as arginylation, and ubiquitination of the polypeptide to?. 术语"蛋白质"也包括"人造蛋白质"，其指由肽的交替重复构成的线型或非线型多肽。 The term "protein" also includes "artificial proteins", which refers to a linear or nonlinear polypeptide by a peptide composed of alternately repeated. 蛋白质的非限制性实例包括基于乳品的蛋白质、基于植物的蛋白质、基于动物的蛋白质和人造蛋白质。  Non-limiting examples of proteins include dairy protein-based, protein-based plant, animal-based protein and synthetic proteins. 基于乳品的蛋白质包括例如酪蛋白、酪蛋白盐(例如，所有形式，包括酪蛋白钠、酪蛋白钙、酪蛋白钾）、酪蛋白水解物、乳清（例如，所有形式，包括浓缩物、分离物、去矿物质的形式）、乳清水解物、乳蛋白质浓缩物和乳蛋白质分离物。 Dairy-based proteins include such as casein, caseinate (e.g., all forms, including sodium caseinate, calcium caseinate, potassium caseinate), casein hydrolyzate, whey (e.g., all forms including concentrates, isolated was to form minerals), whey hydrolyzate, milk protein concentrate, and milk protein isolate. 基于植物的蛋白质包括例如大豆蛋白质（例如，所有形式，包括浓缩物和分离物）、豌豆蛋白质（例如，所有形式，包括浓缩物和分离物）、卡诺拉（canola)蛋白质（例如，所有形式，包括浓缩物和分离物）、其它植物蛋白质，其市售的有小麦和分级分离小麦蛋白质、玉米蛋白质和其级分(包括玉米醇溶蛋白）、稻蛋白质、燕麦蛋白质、马铃薯蛋白质、花生蛋白质、青豆粉末、菜豆粉末、 以及源自豆、扁豆、豆类植物的任意蛋白质。 Plant-based proteins include soy protein (e.g., all forms including concentrate and isolate), for example, pea proteins (e.g., all forms including concentrate and isolate), canola (canola) protein (e.g., all forms , including concentrates and isolates), other vegetable protein, which is commercially available wheat and fractionated wheat protein, corn protein and fraction thereof (including zein), rice protein, oat protein, potato protein, peanut protein , green beans powder, bean powder, as well as from beans, lentils, any of the proteins of legumes. 基于动物的蛋白质可选自牛肉、家禽、鱼肉、羔羊肉、海鲜或其组合。 Animal-based protein selected from beef, poultry, fish, lamb, seafood or a combination thereof. 本文所用的"合生素"是既含有益生元又含有益生菌的补充剂，所述益生元和益生菌一起发挥作用以改善肠的微生物系统。  As used herein, "synbiotics" is both a probiotic and a prebiotic supplement, together with the prebiotic and the probiotic acts to improve the intestinal microbial system. 本文所用的术语"维生素"应理解为包括微小量的对机体的正常生长和活动必需的、从植物和动物食物天然获得的或合成的各种脂溶性或水溶性有机物质中的任意一种(非限制性实例包括维生素A、维生素B1 (硫胺）、维生素B2(核黄素）、维生素B3(烟酸或烟酰胺）、维生素B5(泛酸）、维生素B6(吡多素、吡哆醛、或吡哆胺、或吡多素盐酸盐）、维生素B7 (生物素）、维生素B9(叶酸)和维生素B12(各种钴胺;通常是维生素补充剂中的氰钴胺）、维生素C、维生素D、维生素E、维生素K、叶酸和生物素）、维生素原、衍生物、类似物。  As used herein, the term "vitamin" is understood to include minor amounts of the body's normal growth and activities necessary, any of various fat-soluble or water-soluble organic material obtained from natural plant and animal food or synthesized in one kind of (non-limiting examples of which include vitamin A, vitamin B1 (thiamine), vitamin B2 (riboflavin), vitamin B3 (niacin or niacinamide), vitamin B5 (pantothenic acid), vitamin B6 (pyridoxine element, pyrazole pyridoxal, or pyridoxamine, or pyridoxal hydrochloride hormone), vitamin B7 (biotin), vitamin B9 (folic acid) and vitamin B12 (various cobalamins; usually cyanocobalamin in vitamin supplements), vitamin C, vitamin D, vitamin E, vitamin K, folic acid and biotin), provitamins, derivatives, analogs. 在一个实施方案中，维生素或矿物质来源可包括特定营养物的至少两种来源或形式。  In one embodiment, the vitamin or mineral sources, or may comprise at least two sources in the form of specific nutrients. 这表示在混合饮食中发现的维生素和矿物质来源混合物。 This means that the source of the vitamin mixture found in a mixed diet and minerals. 此外，在个体吸收特定形式有困难的情况中混合物也可以是保护性的，混合物可以通过使用不同的转运蛋白增加摄入(例如锌、硒)或可以提供特定的健康益处。 In addition, individuals have difficulty absorbing the case of a particular form of a mixture may be protective, the mixture can (e.g. zinc, selenium) or may provide certain health benefits by increasing uptake using different transporters. 作为实例，存在几种形式的维生素E，其中最常消耗和研究的是生育酚(α、β、γ、δ)，较不常用的是生育三烯酚(α、β、γ、δ)，所有这些均在生物活性方面有差异。 As an example, there are several forms of vitamin E, which is the most frequently consumed research and tocopherols (α, β, γ, δ), is less common tocotrienols (α, β, γ, δ), all of which vary in terms of biological activity. 存在结构差异，这使得生育三烯酚能更自由地在细胞膜周围运动；多项研究报道了与胆固醇水平、免疫健康和癌症发生风险降低有关的不同健康益处。 There is a structural difference, which makes tocotrienols can move more freely around the cell membrane; and a number of studies have reported cholesterol levels, immune health and reduce the risk of different cancer-related health benefits. 生育酚和生育三烯酚的混合物将覆盖生物活性范围。 Fertility mixture of phenol and tocotrienols will cover the spectrum of biological activity. 消耗肌肉是运动员中共同的抱怨，特别是参与剧烈的高强度锻炼或耐力活动的运动员。  athletes consume muscle is a common complaint, particularly those involved in strenuous exercise or high-intensity endurance activity athlete. 这些运动员公认的是，肌肉消耗导致他们比所期望的更迅速地停止活动或减慢活动。 These athletes recognized that they lead to muscle wasting activity to stop or slow down activity than expected quickly. 照此，高强度运动员可以受益于延迟肌肉消耗的方法以使他们更长时间、更强烈地锻炼。 As such, high-intensity athletes can benefit from delaying muscle wasting in order to make them longer, more intense exercise. 实际上，在申请人所进行的消费者研究民意测验中，在每个月参与剧烈锻炼24小时以上的消费者中第二高的评分益处是"通过延迟肌肉乳酸的累积具有更强烈的练习。"申请人还发现，如果将能提供这类益处的功能性成分整合成熟悉的受信任的形式例如能量或性能棒， 则消费者吸引力增加。 In fact, consumer research poll conducted by the applicant to participate in strenuous exercise 24 hours or more consumers benefit in the second highest score of each month is "a more intense exercise the muscles of lactic acid by a cumulative delay. "the applicant has also found that if will be able to provide such benefits of functional components integrated into the familiar form of the trusted performance such as energy or bars, the increased consumer appeal. 许多氨基酸在食品工业中用作功能性成分以为消费者提供多种益处。  Many amino acids are used as functional ingredients that provide consumers with a variety of benefits in the food industry. 令人遗憾的是，在食物产品中使用氨基酸并非没有其缺陷。 Unfortunately, the use of amino acids in food products is not without its drawbacks. 例如，这类化合物的分解一般通过在加工和贮存期间与还原糖类反应而出现。 For example, the decomposition of such compounds generally occurs by the reaction with reducing sugars during processing and storage. 实际上，氨基酸(例如丙氨酸)一般与还原糖(例如葡萄糖或果糖单体、乳糖)反应，生成导致褐变的化合物。 In fact, the amino acid (e.g., alanine) generally reducing sugars (e.g. glucose or fructose monomers, lactose) to produce a compound of browning. 该反应被称为"美拉德反应"或"非酶促褐变"。 This reaction is called "Maillard reaction" or "non-enzymatic browning." 除了产生深色外，这类反应还会导致活性化合物损失。 In addition to generating dark outside, such reactions also result in loss of the active compound. 影响美拉德反应的主要因素是已知的（例如氨基的存在、还原糖、ΡΗ、水含量、温度等），可以采取几种行为来帮助减少褐变。  The main factors are known Maillard reaction (e.g., the presence of an amino group, reducing sugars, ΡΗ, water content, temperature, etc. ), can take several acts to help reduce browning. 这类行为包括以下行为：（i)除去还原糖，在含有谷物(例如具有各种可利用的碳水化合物)或乳蛋白质成分(例如存在乳糖）的食物基质中这是困难的；（ii)降低PH，在固体食物基质例如谷物或蛋白质棒中这也是困难的；（iii)降低贮存温度，对贮存稳定的产品而言这是不可能的;和（iv)降低水活性，在不使产品大幅度硬化的情况下其不能被降低很多。 Such behavior includes the following acts: (i) removing the reducing sugar, cereals containing (e.g., having a variety of carbohydrates) or milk protein component (e.g., the presence of lactose) in a food matrix which is difficult; (ii) reducing PH, solid foods such as cereals or protein matrix which is difficult bars; (iii) reducing the storage temperature, storage stability of the products, this is not possible; and (iv) decreased water activity, without causing Great it can not be much reduced amplitude case hardened. 另外，尽管存在强有力的科学证据支持氨基酸β-丙氨酸在缓冲肌肉的酸(H+)和改善高强度锻炼中的作用，但是已知随着某些氨基酸例如丙氨酸的摄入出现轻度感觉异常副作用。  Further, despite the strong scientific evidence to support the amino acid β- alanine (H +) buffer and muscle strength improving effect of exercise, it is known that certain amino acids such as alanine camera paresthesia into mild side effects. 对于旨在上市并向公众销售的食物产品而言，所有这些副作用均被视为是不可接受的。 For aims to market to the public sale of food products, all of these side effects are considered unacceptable. 氨基酸或能用作氨基酸的生物学来源的化合物在食物基质中的稳定将有助于通过减少β-丙氨酸的血浆浓度升高、提供安全有效地增加肌肉中的肌肽生物合成和减少缺氧活动过程中的代谢性酸中毒和肌肉疲劳的方法来减轻这类不良副作用。 Stabilizing compound can be used as an amino acid or amino acids of the biological source of the food matrix will help to increase by reducing the plasma concentration of β- alanine, safe and effective to increase muscle carnosine biosynthesis and reducing hypoxia metabolic acidosis and muscle fatigue during activity to mitigate such adverse side effects. 因此，找到提供食物基质中功能性氨基酸的稳定性的方法是依从性的问题，并且能打开产品创新的新途经。  Thus, finding food matrices provide stability of functional amino acids is to compliance issues, and can be opened via new product innovation. 例如，氨基酸丙氨酸作为乳酸缓冲剂用在运动营养品中以减轻锻炼期间的肌肉疼痛。 For example, the amino acid alanine as lactic acid buffering agent used in sports nutrition to relieve muscle pain during exercise. 提供在食物基质中的稳定化的氨基酸会使消费者的摄取方式多样化并且为食品工业创造机会。 Provide food matrix stabilized amino acid uptake will diversify the way consumers and create opportunities for the food industry. 更特定地，提供具有稳定化的丙氨酸的食物产品会通过缓冲肌肉中累积的酸、延迟肌肉消耗和疲劳而有助于消费者以更高强度练习更长时间，并且因此就种类而言是相关的。 More specifically, there is provided alanine stabilized by the food product will be accumulated in the buffer acid muscle, muscle wasting and fatigue delay help consumers exercise longer at a higher intensity, and therefore in terms of the type It is related. 尽管本公开物涉及食物基质中所有氨基酸的改善的稳定性和具有在所公开的粘合剂组合物中的所有类型的氨基酸的组合物和产品，但是本公开物会涉及具体的氨基酸β_ 丙氨酸。  Although the present disclosure relates to improved stability of all amino acids in food matrices and compositions and products for all types of amino acids in the disclosed adhesive compositions of the present disclosure will be directed to specific amino acid β_ alanine. 另外，并且正如下文在实施例中所示的那样，申请人测试的原型包括特定的氨基酸丙氨酸。 Further, and as as shown below in the examples, Applicants tested a prototype comprising a specific amino acid alanine. β-丙氨酸及其甲基化类似物在人或动物体内形成二肽。  β- alanine and a-methyl analogues of the human or animal body to form a dipeptide. 所述的由β-丙氨酸产生的二肽包括肌肽、鹅肌肽或balenine，它们均参与肌肉收缩期间的胞内pH内稳态的调节，并且因此也参与肌肉疲劳的发生。 Produced by the β- alanine dipeptides include carnosine, anserine or balenine, which are involved in regulating the homeostasis of the intracellular pH during muscle contraction, and therefore also involved in the occurrence of muscle fatigue. 所述二肽提供了使pH敏感性组氨酸残基在细胞中蓄积的有效方式。 The dipeptide provides an efficient way to make the pH-sensitive histidine residues accumulated in the cells. 因此，增加肌肉内这类二肽的量有利地影响能由肌肉执行的工作的性能和量。 Therefore, increasing the performance and the amount of such dipeptide intramuscular favorably influence can be performed by the muscles work. β-丙氨酸可在体内生成或者可通过消耗含有β-丙氨酸的食物来获得。  β- alanine may be generated in vivo or [beta] -alanine may contain food obtained by consumption. 在高强度锻炼期间，在糖原酵解期间形成的水合氢离子(Η 30+)的蓄积和因无氧代谢导致的乳酸蓄积可显著地降低胞内ΡΗ，其会损害肌酸-磷酰肌酸系统的功能。 During high-intensity exercise, hydronium ions (Η 30+) formed during glycolysis and the accumulation of lactic acid by anaerobic metabolism may lead to the accumulation of significantly reduced intracellular ΡΗ which damage creatine - phosphoric muscle acid function of the system. 这类细胞pH的降低还会影响细胞内的其它功能，例如肌纤维中收缩蛋白质的功能。 Reducing the pH of such cells also affect other functions within the cell, such as functional proteins in muscle fiber contraction. 给个体施用丙氨酸能增加肌肉丙氨酰基组氨酸肽浓度，并且因此增加肌内缓冲能力。 Alanine can be administered to an individual to increase muscle alanyl-histidine peptide concentrations, and thus increase the buffering capacity intramuscularly. 因此，提供β-丙氨酸或为β-丙氨酸生物学来源的化合物(例如肌肽、鹅肌肽或巴拉宁(balanine)、及其盐和化学衍生物)是通过延迟无氧锻炼期间的疲劳发作来减弱高强度锻炼期间导致的代谢性酸中毒的一种方式。  Accordingly, β- alanine or a compound (e.g., carnosine, anserine or Ba Laning (balanine), and salts and chemical derivatives thereof) biologically derived by delaying anaerobic β- alanine the onset of fatigue during exercise to weaken a way of metabolic acidosis caused during high-intensity exercise. 丙氨酸的生物学来源是当通过任意途经(例如肠胃外、口服、局部等)施用于身体时通过一种或多种化学-或酶-催化的反应步骤转化成丙氨酸的化合物。 Alanine biological source when passing through an arbitrary (e.g. parenteral, oral, topical, etc.) applied to the body through one or more chemical - or enzyme - catalyzed reaction step converted to alanine compound. 然后转化的丙氨酸出现在血液、血浆或血清中，并且可供肌肉和其它组织摄取。 Alanine is then converted appear in the blood, plasma or serum, muscle and other tissues and for uptake. 本公开物涉及开发将缓冲肌肉的氨基酸化合物递送给运动员的产品。  The present disclosure relates to the development buffer amino acid compound muscle products delivered to athletes. 更具体地， 本公开物的实施方案涉及提供含有在具有低含量的还原糖或基本上不含还原糖的粘合剂组合物中的稳定化的丙氨酸的食物产品。 More specifically, embodiments of the present disclosure is directed to providing an alanine containing stabilized substantially free of a reducing sugar or a reducing sugar in a binder composition having a low content of a food product. 本公开物提供了稳定固体棒基质中的丙氨酸和避免在加工/贮存期间因美拉德型反应导致的降解和褐变的技术方案。 The present disclosure provides a stable solid stick matrix and to avoid degradation and alanine aspect browning during processing / storage due to Maillard-type reactions caused. 尽管本说明书主要涉及固体食物基质，例如能量棒，但是也研究了其它产品组合物和形式，并且发现其提供了丙氨酸的稳定性。  Although the present description primarily relates to solid food substrate, e.g., energy bars, but also to study the composition and other product forms, and found to provide stability alanine. 实际上，本公开物提供了解决保持丙氨酸在谷物或蛋白质棒基质中或即饮型形式中稳定的问题的方案。 Indeed, the present disclosure provides a solution to alanine held cereal bars or protein matrix or ready to drink form stability problems. 为了确定食物产品中β-丙氨酸的稳定性，开发了含有β-丙氨酸的不同产品形式的原型并且提供了技术方案(例如除去还原糖和降低pH)，以确保活性化合物的可接受的稳定性。  In order to determine the stability of β- alanine in the food product, a prototype of different product forms containing β- alanine and provides a technical solution (e.g. to remove reducing sugars and reducing the pH), to ensure that the active compound acceptable stability. 概括而言，申请人发现：（i)谷物棒(例如麦棒(granola bar))原型在20°C下贮存约12个月后具有约78%的β-丙氨酸回收率，在30 °C下贮存6个月后具有约79%的β-丙氨酸回收率； (ii)蛋白质棒原型在30 °C下贮存6个月后具有高达97 %的β-丙氨酸回收率;和（iii)即饮型("RTD"）组合物在延长加热(80°C，1小时）后就具有1.6gi3-丙氨酸/200ml的饮料而言没有观察到β-丙氨酸损失。 In summary, the Applicant has found that: (i) a cereal bar (e.g., granola bar (granola bar)) prototypes stored at 20 ° C approx 12 months after having about 78% recovery of β- alanine in 30 ° after 6 months of storage of about 79% recovery of β- alanine at C; (ii) a protein bar prototypes stored at 30 ° C 6 months after having β- alanine recovery up to 97%; and (iii) ready to drink ( "RTD") after the composition has a loss β- alanine-alanine was not observed in terms 1.6gi3- / 200ml beverage prolonged heating (80 ° C, 1 hour). 在第一个实施方案中，制备了谷物麦棒原型，其包含与粘合剂混合的β-丙氨酸粉末。  In a first embodiment, the wheat cereal bars prepared prototype, comprising β- alanine powder is mixed with the binder. 已知本领域常用的粘合剂含有还原糖。 Adhesive known in the art commonly contain sugar. 实际上，申请人制备的含有丙氨酸的且包含典型粘合剂的第一种谷物或蛋白质棒仅在环境温度下贮存几个月后就变成了黑色。 In fact, a first protein or cereal bars and typically comprise a binder prepared containing alanine applicant only after many months of storage at ambient temperature turned black. 因此，仅使用具有低含量的还原糖或基本上不含还原糖的粘合剂(例如麦芽糖醇糖浆"Lycasin 75/ 75"和/或蔗糖糖浆)制备了本公开物中测试的原型。 Thus, the prototype of the present disclosure was prepared using only tested substantially free of reducing sugars or reducing sugar binders (e.g., maltitol syrup "Lycasin 75/75" and / or sucrose syrup) having a low content. 通过使用这类粘合剂，申请人发现，β-丙氨酸与含有还原糖的谷物谷粒/松脆物保持分开。 By using such an adhesive, applicant has found, [beta] -alanine and cereal grains / crisps containing a reducing sugar kept separate. 如上文所讨论的，在贮存试验的实验室分析显示了所述棒内β-丙氨酸的令人惊讶地好的稳定性。 In storage tests of laboratory analysis shows the inner rod β- alanine surprisingly good stability as discussed above. 棒的褐变不显著强于所制备的不含有丙氨酸的参比棒中的褐变。 Bar does not significantly stronger than the browning prepared containing no alanine browning of the reference bar. 在第二个实施方案中，制备了蛋白质棒原型，其包含在基本上不含还原糖(例如麦芽糖醇和/或蔗糖糖浆)的粘合剂中的丙氨酸以及具有低含量的还原糖的蛋白质成分。  In a second embodiment, the prototype of the protein bar was prepared, which contained alanine substantially free of reducing sugars (e.g. maltitol and / or sucrose syrup) and a binder having a low content of reducing protein component sugars. 例如，大豆蛋白质分离物天然地具有低含量的还原糖。 For example, soy protein isolate naturally having a low content of reducing sugars. 在一个实施方案中，蛋白质棒原型中所包含的乳蛋白质含有小于或等于0.2%的乳糖。 In one embodiment, the milk protein contained in the protein bar prototypes contain less than or equal to 0.2% lactose. 如上文所讨论的，贮存期间的实验室结果显示在30°C下贮存6个月后β-丙氨酸的回收率高达97%。 Laboratory results, during storage as discussed above to display after 6 months storage β- alanine recovery of up to 97% at 30 ° C.
 概括而言，本发明的组合物和产品可以包含在粘合剂组合物中的任意氨基酸。  In summary, the compositions and products of the invention may comprise any amino acid in the adhesive composition. 氨基酸的非限制性实例包括异亮氨酸、丙氨酸、亮氨酸、天冬酰胺、赖氨酸、天冬氨酸、甲硫氨酸、半胱氨酸、苯丙氨酸、谷氨酸、苏氨酸、谷氨酰胺、色氨酸、甘氨酸、缬氨酸、脯氨酸、丝氨酸、酪氨酸、精氨酸、瓜氨酸、组氨酸或其组合。 Non-limiting examples of amino acids include isoleucine, alanine, leucine, asparagine, lysine, aspartic acid, methionine, cysteine, phenylalanine, glutamic acid, threonine, glutamine, tryptophan, glycine, valine, proline, serine, tyrosine, arginine, citrulline, histidine, or a combination thereof. 在一个实施方案中，所述氨基酸是丙氨酸。 In one embodiment, the amino acid is alanine. 本发明的组合物和产品还可以包含氨基酸的生物学来源。 The compositions and products of the invention may also comprise a biological source of amino acids. 例如，所述组合物和产品可以包含丙氨酸的生物学来源，包括例如肌肽、丝氨酸、巴拉宁、及其盐和化学衍生物。 For example, the compositions and products may comprise biological source alanine, carnosine include, for example, serine, Ba Laning, and chemical derivatives and salts thereof. 所述氨基酸或其生物学来源可以以任意形式被提供，包括例如粉末、晶体等。 The amino acid or biological source may be provided in any form, including, for example, powders, crystals and the like. 氨基酸可以在组合物中以约1 %重量-约20%重量、或约2 %重量-约10 %重量、或约4%重量的量被提供。  Amino acids may be present in the composition at about 1% by weight - about 20% by weight, or about 2% by weight - about 10 wt%, or about 4% by weight is provided. 在一个实施方案中，氨基酸在组合物中以约4%重量的量被提供。 In one embodiment, the amino acid is provided in an amount of about 4% by weight of the composition. 在另一些实施方案中，氨基酸以每份大小的组合物中约lg-约5g、或者约2g或3g的量被提供。 In other embodiments, the amino acid composition of each size of from about 5g to about lg-, or an amount of about 2g or 3g is provided. 在一个实施方案中，氨基酸可以以每份大小的组合物中约1.6g的量被提供。 In one embodiment, the amino acid may be provided a composition in an amount of about 1.6g per serving size is. 在另一个实施方案中，氨基酸可以以每份大小的组合物中约3.2g的量被提供。 In another embodiment, the amino acid may be provided a composition in an amount of about 3.2g per serving size is. 每份大小的组合物可以是约30g-约90g、或约50g。 Each serving size composition may be from about 30g- about 90g, or about 50g. 对初始肌肽荷载期而言每日推荐剂量是3.2gi3-丙氨酸/天，持续约4 周。 For the initial load of carnosine recommended daily dose is 3.2gi3- alanine / day for about 4 weeks. 因此，在一个实施方案中，本公开物的产品包含约1.6gi3-丙氨酸/份。 Thus, in one embodiment, the product of the present disclosure comprise about 1.6gi3- alanine / parts. 氨基酸可以在组合物中以约10%重量-约50 %重量、或约20 %重量-约40%重量、 或约30%重量的量被提供。  Amino acids may be present in the composition at about 10% by weight - about 50% by weight, or about 20% by weight - about 40% by weight, or about 30% by weight is provided. 在一个实施方案中，氨基酸在组合物中以约12-13%重量的量被提供。 In one embodiment, the amino acid is provided in an amount of about 12-13% by weight of the composition. 在另一个实施方案中，氨基酸在组合物中以约35-40%重量、或约37.5%的量被提供。 In another embodiment, the amino acid is provided, an amount of about 37.5%, or from about 35-40% by weight of the composition. 在另一些实施方案中，氨基酸可以以每份大小的组合物中约lg-约5g、或者每份大小的组合物中约2或3g的量被提供。 In other embodiments, the amino acid composition of each may be sized from about lg- about 5g, per size or amount of the composition or in about 2 to 3g are provided. 在一个实施方案中，氨基酸可以以每份大小的组合物中约1.6g的量被提供。 In one embodiment, the amino acid may be provided a composition in an amount of about 1.6g per serving size is. 在另一个实施方案中，氨基酸可以以每份大小的组合物中约3.2g的量被提供。 In another embodiment, the amino acid may be provided a composition in an amount of about 3.2g per serving size is. 每份大小的组合物可以是约40g-约60g、或约50g。 Each serving size composition may be from about 40g- about 60g, or about 50g. 对初始肌肽荷载期而言每日推荐剂量是3.2gi3-丙氨酸/天，持续约4周。 For the initial load of carnosine recommended daily dose is 3.2gi3- alanine / day for about 4 weeks. 因此，在一个实施方案中，本公开物的产品包含约1.6gi3-丙氨酸/份。 Thus, in one embodiment, the product of the present disclosure comprise about 1.6gi3- alanine / parts. 本公开物中使用的粘合剂是具有低含量的还原糖或基本上不含还原糖的粘合剂， 例如葡萄糖单体、果糖单体、乳糖等。  The present disclosure is used in the binder substantially free of reducing sugars or reducing sugar with a low content of binder, for example glucose monomers, monomers fructose, lactose and the like. 可用在本公开物中的粘合剂的实例包括例如麦芽糖醇糖浆、蔗糖糖浆以及麦芽糖醇和蔗糖糖浆共混物。 Examples of useful adhesives in the present disclosure include, for example, maltitol syrup, sucrose syrup and maltitol and sucrose syrup blend. 在一个实施方案中，所述粘合剂主要由麦芽糖醇糖浆组成。 In one embodiment, the binder consists essentially of a maltitol syrup. 在另一个实施方案中，所述粘合剂主要由蔗糖糖浆组成。 In another embodiment, the binder consists essentially of a sucrose syrup. 在还有另一个实施方案中，所述粘合剂主要由麦芽糖醇和蔗糖糖浆共混物组成。 In yet another embodiment, the binder consists essentially of sucrose, maltitol syrup blends thereof. 通过将氨基酸掺入本公开物的粘合剂中，氨基酸在一定程度上被与可加入本发明的组合物或产品中的任意另外的成分隔离或分开。 By incorporating the amino acid composition of the adhesive of the present disclosure, the amino acid is isolated or separated from the additional ingredients may be added to the present invention, any composition or product to some extent. 这有助于减少任何可能涉及氨基酸的反应，所述反应由此导致氨基酸活性的损失、广品的褐变等。 This helps to reduce the reaction may involve any amino acid, said reaction resulting in a loss of activity of an amino acid, a wide browning products. 与本发明的食物产品和方法有关的另外的信息和公开内容将在下面的实施例中给出。  Further details and disclosures of the food product and method of the present invention will be given relating to the following embodiments. 本发明的食物产品可以是营养组合物或营养产品，可以包含有益的或功能性的成分。  Food products of the invention may be a nutritional composition or nutritional product may include ingredients or beneficial functionality. 例如，所述食物产品可以包含具有低含量的还原糖的蛋白质来源。 For example, the food product may comprise a source of protein having a low content of reducing sugars. 所述蛋白质来源可以是膳食蛋白质，包括但不限于动物蛋白质(例如肉蛋白或卵蛋白）、乳蛋白质(例如，酪蛋白、 酪蛋白盐(例如，所有形式，包括酪蛋白钠、酪蛋白钙、酪蛋白钾）、酪蛋白水解物、乳清（例如，所有形式，包括浓缩物、分离物、去矿物质的形式）、乳清水解物、乳蛋白质浓缩物和乳蛋白质分尚物））。 The dietary protein may be a protein source, including but not limited to animal protein (e.g., meat protein or egg protein), milk proteins (e.g., casein, caseinate (e.g., all forms, including sodium caseinate, calcium caseinate, potassium caseinate), casein hydrolyzate, whey (e.g., all forms including concentrate, isolate, demineralized form), whey hydrolyzate, milk protein concentrate and milk protein fraction was still)). 植物蛋白质（例如大ϋ蛋白质、小麦蛋白质、稻蛋白质和婉ϋ蛋白质）、或其组合。 Vegetable proteins (such as large ϋ protein, wheat protein, rice protein and protein wan ϋ), or combinations thereof. 在一个实施方案中，所述蛋白质来源选自酪蛋白钙、乳清蛋白质、大豆蛋白质分离物、 乳蛋白质、或其组合。 In one embodiment, the protein source is selected from calcium caseinate, whey protein, soy protein isolates, milk proteins, or combinations thereof. 所述蛋白质可以是粉末形式的。 The protein may be in powder form. 在一个实施方案中，所述食物产品进一步包含一种或多种不含有还原糖的益生元。  In one embodiment, the food product further comprises one or more prebiotics does not contain a reducing sugar. 所述益生元可以选自阿拉伯胶、α葡聚糖、阿拉伯半乳聚糖、β葡聚糖、右旋糖苷、低聚果糖、低聚半乳糖、半乳甘露聚糖、低聚龙胆糖、低聚葡萄糖、瓜尔胶、菊粉、低聚异麦芽糖、低聚乳果糖、乳果糖、果聚糖、麦芽糖糊精、部分水解的瓜尔胶、果胶低聚糖、回生淀粉、大豆低聚糖、糖醇、低聚木糖、或其组合。 The prebiotic may be selected from gum arabic, [alpha] dextran, arabinogalactan, beta] glucan, dextran, fructooligosaccharides, galactooligosaccharides, galactomannans, gentiooligosaccharide , glucooligosaccharides, guar gum, inulin, isomalto-oligosaccharide, lactosucrose, lactulose, levan, maltodextrins, partially hydrolyzed guar gum, pectin oligosaccharide, retrograded starch, soybean oligosaccharides, sugar alcohols, xylooligosaccharides, or combinations thereof. 在一个实施方案中，所述益生元不含还原糖。  In one embodiment, the prebiotic free of reducing sugars. 在一个实施方案中，所述食物产品进一步包含一种或多种益生菌，其选自气球菌属、曲霉属、拟杆菌属、双歧杆菌属、假丝酵母属、梭菌属、德巴利酵母属、肠球菌属、梭杆菌属、乳杆菌属、乳球菌属、明串珠菌属、蜜蜂球菌属、微球菌属、毛霉属、酒球菌属、片球菌属、 青霉属、消化链球菌属、毕赤酵母属、丙酸杆菌属、假链状菌属、根霉属、酵母属、葡萄球菌属、链球菌属、球拟酵母属、魏斯氏菌属或其组合。  In one embodiment, the food product further comprises one or more probiotics, selected from Aerococcus, Aspergillus, Bacteroides, Bifidobacterium, Candida, Clostridium , Debaryomyces spp., Enterococcus spp., Fusobacterium, Lactobacillus, Lactococcus, Leuconostoc, Lactococcus bees, Micrococcus, Mucor, Oenococcus, Pediococcus, Penicillium genus Peptostreptococcus, the genus Pichia, the genus Propionibacterium, pseudocatenulatum species, Rhizopus, Saccharomyces, Staphylococcus, Streptococcus, Torulopsis, or Weissella combination. 所述食物产品还可以包含纤维来源、纤维或不同类型的纤维共混物。 The  The food product may further comprise a source of fiber, fibers, or a blend of different types of fibers. 所述纤维共混物可以含有可溶性和不溶性纤维的混合物。 The fiber blend may contain a mixture of soluble and insoluble fibers. 可溶性纤维可以包括例如低聚果糖、阿拉伯胶、菊粉等。 Soluble fibers may include for example fructooligosaccharides, gum arabic, inulin and the like. 不溶性纤维可以包括例如豌豆外部纤维(pea outer fiber)。 Insoluble fibers may include, for example, outer pea fiber (pea outer fiber). 在一个实施方案中，所述纤维不含还原糖。  In one embodiment, the fibers are free of reducing sugars. 在一个实施方案中，所述食物产品进一步包含碳水化合物来源。  In one embodiment, the food product further comprises a carbohydrate source. 任意适合的碳水化合物均可用于本发明的营养组合物，包括但不限于蔗糖、改性淀粉、直链淀粉、木薯淀粉、 玉米淀粉、以及乳糖、葡萄糖、果糖的变体、玉米糖浆固体、不含还原糖的麦芽糖糊精、或其组合。 Any suitable carbohydrate may be used in the nutritional composition of the present invention, including but not limited to, sucrose, modified starch, amylose starch, tapioca starch, corn starch, and lactose, glucose, fructose variant, corn syrup solids, not maltodextrin-containing reducing sugar, or a combination thereof. 在一个实施方案中，所述食物产品进一步包含脂肪来源。  In one embodiment, the food product further comprises a fat source. 所述脂肪来源可包括任意适合的脂肪或脂肪混合物。 The source of fat may comprise any suitable fat or fat mixture. 例如，所述脂肪可以包括但不限于植物脂肪(例如橄榄油、玉米油、葵花油、菜子油、榛子油、豆油、棕榈油、椰子油、卡诺拉油(canola oi 1)、卵磷脂等)和动物脂肪(例如乳脂肪）。 For example, the fats can include but are not limited to, vegetable fats (e.g. olive oil, corn oil, sunflower oil, rapeseed oil, hazelnut oil, soybean oil, palm oil, coconut oil, canola oil (canola oi 1), and lecithin ) and animal fats (such as milk fat). 在一个实施方案中，所述食物产品进一步包含一种或多种合生素、植物营养素和/ 或抗氧化剂。  In one embodiment, the food product further comprises one or more synbiotics, plant nutrient and / or antioxidants. 所述抗氧化剂可以选自类胡萝卜素、辅酶Q10("C 〇Q10"）、类黄酮、谷胱甘肽、 Go ji (枸杞属）、橙皮苷、Lactowolfberry、木酚素、叶黄素、番茄红素、多酚、硒、维生素A、维生素B1、维生素B6、维生素B12、维生素C、维生素D、维生素E或其组合。 The antioxidant may be selected from carotenoids, coenzyme Q10 ( "C 〇Q10"), flavonoids, glutathione, Go ji (wolfberry), hesperidin, Lactowolfberry, lignans, lutein, lycopene, polyphenols, selenium, vitamin A, vitamin B1, vitamin B6, vitamin B12, vitamin C, vitamin D, vitamin E, or a combination thereof. 在一个实施方案中，所述食物产品进一步包含一种或多种维生素和矿物质。  In one embodiment, the food product further comprises one or more vitamins and minerals. 维生素的非限制性实例包括维生素A、复合维生素B(例如Β-1、Β-2、Β-6和B-12)、维生素C、维生素D、维生素E和微生物K、烟酸和酸性维生素例如泛酸和叶酸、生物素或其组合。 Non-limiting examples of vitamins include vitamin A, vitamin complex B (e.g. Β-1, Β-2, Β-6 and B-12), vitamin C, vitamin D, vitamin E and microbial K, niacin and acid vitamins e.g. pantothenic acid and folic acid, biotin, or combinations thereof. 矿物质的非限制性实例包括妈、铁、锌、镁、碘、铜、磷、猛、钾、络、钼、硒、镍、锡、娃、银、硼或其组合。 Non-limiting examples of minerals include mother, iron, zinc, magnesium, iodine, copper, phosphorus, manganese, potassium, network, molybdenum, selenium, nickel, tin, baby, silver, boron, or combinations thereof. 在一个实施方案中，所述食物产品包含至少一种ω-3脂肪酸来源。  In one embodiment, the food product comprises at least one ω-3 fatty acid source. 所述来源可以是例如鱼油、磷虾、ω -3的植物来源、亚麻子、核桃和藻。 The source may be, for example, fish oil, krill, of ω -3 plant origin, flaxseed, walnut and algae. ω -3脂肪酸的实例包括例如α-亚麻酸（"ALA"）、二十二碳六烯酸（"DHA"）和二十碳五烯酸（ΈΡΑ"）或其组合。 Examples of ω-3 fatty acids include, for example, α- linolenic acid ( "ALA"), docosahexaenoic acid ( "DHA") and eicosapentaenoic acid (ΈΡΑ "), or combinations thereof. 在另一个实施方案中，所述食物产品可以包含至少一种核苷酸。  In another embodiment, the food product may comprise at least one nucleotide. 可以加入其它任选的成分以使食物产品具有足够的适口性。  Other optional ingredients may be added to make the food product has a sufficient palatability. 例如，本公开物的食物产品可以任性地包含常规的食品添加剂，例如酸化剂、另外的增稠剂、缓冲剂或pH调节剂、螯合剂、着色剂、乳化剂、赋形剂、矫味剂、矿物质、等渗剂、药学上可接受的载体、防腐剂、稳定剂、糖、甜味剂、组织形成剂中的任意一种或其组合。 For example, the food product of the present disclosure may contain conventional willful food additive, e.g. acidifying agents, additional thickeners, buffers or pH adjusting agents, chelating agents, colorants, emulsifiers, excipients, flavoring agents , minerals, isotonic agents, pharmaceutically acceptable carriers, preservatives, stabilizing agents, sugars, sweeteners, any texturizing agent or a combination thereof. 所述任选的成分可以以任意适合的量被加入。 The optional ingredients may be added in any suitable amount. 消耗肌肉是运动员中共同的抱怨，特别是从事耐力活动的那些运动员。  athletes consume muscle is a common complaint, especially those athletes engaged in endurance activities. 运动员认为肌肉消耗导致他们比其所希望的那样更迅速地停止活动或减慢活动。 Athletes say that they cause muscle wasting more than cease their activities or slow down the activities that they want quickly. 在先前的消费者认知分析中，消费者对能通过消耗天然存在的氨基酸来延迟肌肉消耗和以更长时间和更大强度练习显示出了积极的兴趣。 In a previous analysis of consumer awareness, consumers can consume naturally occurring amino acid to retard muscle wasting and showed active interest in a longer and more intense exercise. 实际上，消费者研究团队发现，"通过延迟肌肉乳酸的累积具有更强烈的练习"是消费者所期望的第二高的评分益处。 In fact, consumer research team found that "a more intense exercise the muscles of lactic acid by a cumulative delay" consumers expect the second-highest score benefits. 申请人进行的定性研究还发现，如果以熟悉的和可信赖的形式例如固体食物棒提供成分，则功能性或有益性成分的吸引力增加。 Qualitative research conducted by the applicant also found that if the form of the familiar and reliable solid food bar offers components such as, the attractive or beneficial functional ingredients increases. 存在强有力的科学证据支持氨基酸β-丙氨酸在缓冲肌肉的酸(H+)和改善高强度锻炼中的作用。  scientific evidence to support the presence of a strong acid β- alanine in muscle buffered acid (H +) and the improvement in high-intensity exercise. 因此，申请人制备并测试了一些食物产品原型，以确定是否能提供足够水平的丙氨酸来促进肌肉肌肽合成和随后的肌肉缓冲和性能益处。 Therefore, the preparation of the applicant and tested some of the food product prototype to determine whether it can provide sufficient levels of alanine to promote the synthesis of peptide-muscle and subsequent muscle buffering and performance benefits. 实际上，申请人开发并测试了含有反应性氨基酸（即β-丙氨酸）的多种产品形式的原型。  Indeed, the Applicant developed and tested a variety of product forms containing a reactive amino acid (i.e., β- alanine) of the prototype. 为了确保食物产品中丙氨酸的稳定性，在生成所述多种产品形式期间的焦点包括从产品中除去还原糖和降低产品的pH。 In order to ensure stability of the food product alanine, the focus during the generation of the variety of product forms of reducing sugars and include lowering the pH of the product was removed from the product. 另外，可以获得消费者认知以确定基于食物的β-丙氨酸产品是否是符合需要的。  In addition, consumer awareness can be obtained to determine based on whether the food product is in line with β- alanine needed. 先前的结果显示，一旦增加肌肉肌肽，则仅需要1.6gi3_丙氨酸/天来维持肌肉肌肽储存，这是食品形式中可实现的。 Previous results show, once to increase muscle carnosine, only need 1.6gi3_ alanine / day to maintain muscle carnosine stores, which is in the form of food that can be achieved. 因此，将来消费者可以历经约4周用3.2gi3_丙氨酸/天、使用现有的缓慢释放片来升高它们的肌肉肌肽，然后可以具有通过消耗食物产品例如下面所述的那些中掺入的丙氨酸来维持有效水平的选择。 Thus, the future consumers over about 4 weeks 3.2gi3_ alanine / day using conventional slow release sheet to increase their muscle carnosine, then by consuming the food product may have, such as those described below in doped alanine selected to maintain the effective level. 第一个试验的焦点集中在符合消耗β-丙氨酸的最佳时间的能量棒。  focal point of the first test focused on the best time to consume energy bars of β- alanine. 开发了麦-型棒，其具有约40g_约60g的份大小，并且含有1.6gi3_丙氨酸。 Developed wheat - type bar having a size of about 40g_ parts to about 60g and contains an alanine 1.6gi3_. 然而，典型的能量棒含有较高量的还原糖（例如葡萄糖、果糖），在存在游离氨基酸的情况下它们参与美拉德反应。 However, typical energy bar containing a higher amount of reducing sugars (e.g. glucose, fructose), in the presence of free amino acids are involved in the Maillard reaction. 还原糖(例如葡萄糖/果糖糖浆、稻糖浆)主要存在于粘合剂中、脱水的水果片中，更低程度上存在于谷物松脆物/薄片(flake)中。 Reducing sugars (such as glucose / fructose syrup, rice syrup) is mainly present in the adhesive, the dehydrated fruit flakes, to a lesser extent in grains crisps / sheet (Flake) in. 如图1中所示，第一批棒呈现出了贮存期问题，在贮存3个月后具有深色/黑色，在存在还原糖的情况下具有很大程度的丙氨酸降解，这甚至在环境温度下发生，如图2中所示。  As shown in FIG. 1, the first rod presents a problem of storage, with a dark / black after 3 months storage, alanine having a large degree of degradation in the presence of reducing sugars, this occurs even at ambient temperature, as shown in FIG. 图1中的麦棒含有1.6gi3-丙氨酸/份从左到右分别在4°C、20°C和30°C的温度下贮存了3 个月。 FIG 1 granola bars containing 1.6gi3- alanine / parts left to right are stored for 3 months at 4 ° C, 20 ° C and 30 ° C to. 图2显示了不同贮存期限条件下麦棒的平均β-丙氨酸回收率。 Figure 2 shows the average β- alanine recovery period under different storage conditions of granola bars. 所有样品（棒和RTD)均一式两份地制备。  All samples (bars and RTD) prepared in duplicates. 在制备过程中加入内标（即L-磺基丙氨酸)。 Internal standard was added during the manufacturing process (i.e. L- cysteic acid). 为了提取样品中加入的游离β-丙氨酸，将整个棒在1升的容量瓶中与去离子水一起匀化。  In order to extract a sample of free β- alanine was added, and the whole of the rod in a 1 liter volumetric flask and homogenized with deionized water. 在连续稀释和过滤后，溶液准备完毕以进行分析。 After serial dilution and filtration, the solution is ready for analysis. 使用氨基酸分析仪（Biochrom 30，Biochrom Ltd,Cambridge,UK;PEEK Li柱， Laborservice Onken GmbH，DGriindau)测定所有游离β-丙氨酸分析(棒和RTD)。  using an amino acid analyzer (Biochrom 30, Biochrom Ltd, Cambridge, UK; PEEK Li column, Laborservice Onken GmbH, DGriindau) all of the free β- alanine analysis were measured (sticks and RTD). 该仪器具有使用茚三酮的柱后衍生化。 After the instrument has derivatized column using ninhydrin. 将包括丙氨酸的氨基酸与茚三酮混合，其使得它们能在可见光波长下被检测并且因此使它们能被定量。 The amino acids include alanine mixed with ninhydrin, which allows them to be detected in the visible wavelengths and thus they can be quantified. 先前的来自由申请人进行的人研究的结果显示，当在含有β-葡聚糖的基质中给予肌酸时尿肌酸排泄（即损失)大大减少。  The results of previous human studies conducted by the Applicant consisting of a display, when administered in a matrix containing creatine β- glucan urinary excretion of creatine (i.e., loss) greatly reduced. 为了模拟这种"控制释放"特性，用β-葡聚糖松脆物配制麦棒。 To simulate this "controlled release" properties, granola bars formulated with β- glucan crisps. 在下面的原型中，主要通过用麦芽糖醇糖浆（例如JLycasin® 75/75)或蔗糖糖浆替代常用的粘合剂来除去还原糖(例如葡萄糖、果糖）。  In the following prototype, primarily maltitol syrup (e.g. JLycasin® 75/75) sucrose syrup or alternatively used to remove adhesive reducing sugars (e.g. glucose, fructose) by. 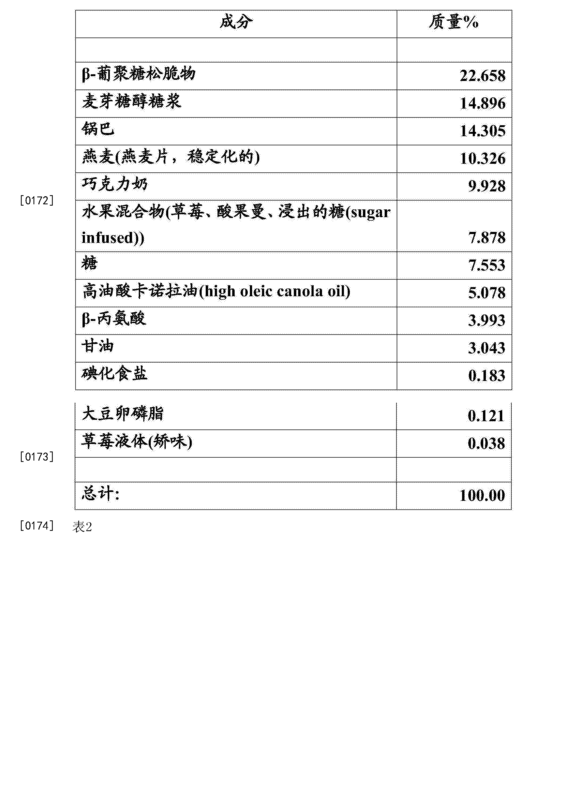 麦棒的配方在下面的表1-2中给出。 Granola bar formulations are given below in Table 1-2. 下面表2的试验1包括约22%β-葡聚糖松脆物(例如挤出的麸糠），下面表2中的试验2不包括葡聚糖松脆物。 Test 12 below comprise from about 22% β- glucan crisps (e.g. extruded bran), the following Table 2 Test 2 does not include dextran crisps table. 贮存试验的结果显示了较好的稳定性，在20°C下12个月后回收率约78%，在30°C 下6个月后回收率~79%，如图3-4中所示。  The results of the storage tests showed good stability at 20 ° C 12 months about 78% recovery at 30 ° C ~ 79% recovery for 6 months, 3-4 in FIG. in FIG. 图4显示了分别在20 °C和30 °C下贮存期间具有减少的还原糖的麦棒中的β-丙氨酸浓度。 Figure 4 shows the concentration of β- alanine, respectively, with a reduced sugar during storage at 20 ° C and 30 ° C in a granola bar. 计算两个棒的平均值和标准差，每种棒被一式两份地进行分析。 Two calculated mean and standard deviation bars, each bar was analyzed in duplicate. 所述棒中β-丙氨酸的剂量是1.6gi3-丙氨酸/40g份。 The dose rod is 1.6gi3- β- alanine-alanine / 40g parts. 基于这些结果，将必需使用约25%的超过剂量(如果局部耐受性允许的话），以保证在约一年的贮存期结束时符合标称的量。 Based on these results, approximately 25% of the required dose exceeds (if allowed by local tolerance), to ensure compliance with the nominal amount of about one year at the end of the storage period. 此外，已知美拉德反应动力学在较低pH下较慢。  Further, it is known Maillard reaction kinetics is slower at lower pH. 因此，申请人还使用降低粘合剂pH 的硫酸氢钠开发了本发明的棒的变型。 Accordingly, Applicants have also developed a variant of the invention the rod is reduced using sodium bisulfite pH of the binder. 这些另外的试验不必然提供盖然的稳定性，丙氨酸回收率(或损失)大致等于中性pH棒。 These tests do not necessarily provide additional stability probability of recovery alanine (or loss) is substantially equal to a neutral pH bar. 棒#3:无β-葡聚糖松脆物（用燕麦片和锅巴替代），其对应于上面表2中试验#2的配制物。  Stick # 3: no β- glucan crisps (oatmeal and crust with substitutions), which corresponds to the above Table 2 Test formulation # 2. 图5-6给出了含有1.6gi3_丙氨酸的麦棒的图像，从左到右为β-葡聚糖松脆物、"高纤维麸糠秸杆"和无葡聚糖松脆物。  Figure 5-6 shows the image granola bars containing 1.6gi3_ alanine, β- glucan crisps from left to right, "high fiber bran straw" and no dextran crisps. 三种变型含有1.6gi3-丙氨酸± 8 % /40g的份，如每个变型中的β-丙氨酸定量所证实的那样。 1.6gi3- three variants containing alanine ± 8% / 40g of parts, such as quantitative β- alanine in each modification as demonstrated. 开发了具有β-丙氨酸和具有麦芽糖醇/蔗糖糖浆作为粘合剂的蛋白质棒的小试规模(bench seale)原型。  developed a bench scale as a protein bar binder (bench seale) having a prototype having β- alanine maltitol / sucrose syrup. 然而，结果显示在30°C下1个月的贮存期后已经褐变，如图7中所示。 However, the results have been displayed after the storage period under the browning 30 ° C 1 month, as shown in FIG. 申请人相信褐变最可能归因于蛋白质成分的乳糖含量。 Applicants believe that browning is most likely due to the lactose content of protein components. 因此，开发了另外的原型，通过选择具有低含量乳糖的蛋白质粉末将乳糖的存在减至最低(例如〈0.2%乳糖）。  Thus, a further development of the prototype, by selecting a low lactose content of protein powder to minimize the presence of lactose (e.g., <0.2% lactose). 结果显示在30°C下贮存6个月后存在有限的褐变(具有蔗糖糖浆粘合剂的变型)或没有褐变(具有麦芽糖醇粘合剂的变型），如图8中所示。 The results showed that storage at 30 ° C there is limited browning (sucrose syrup having adhesive variant) or no browning (maltitol having adhesive variant) after 6 months, as shown in Fig. 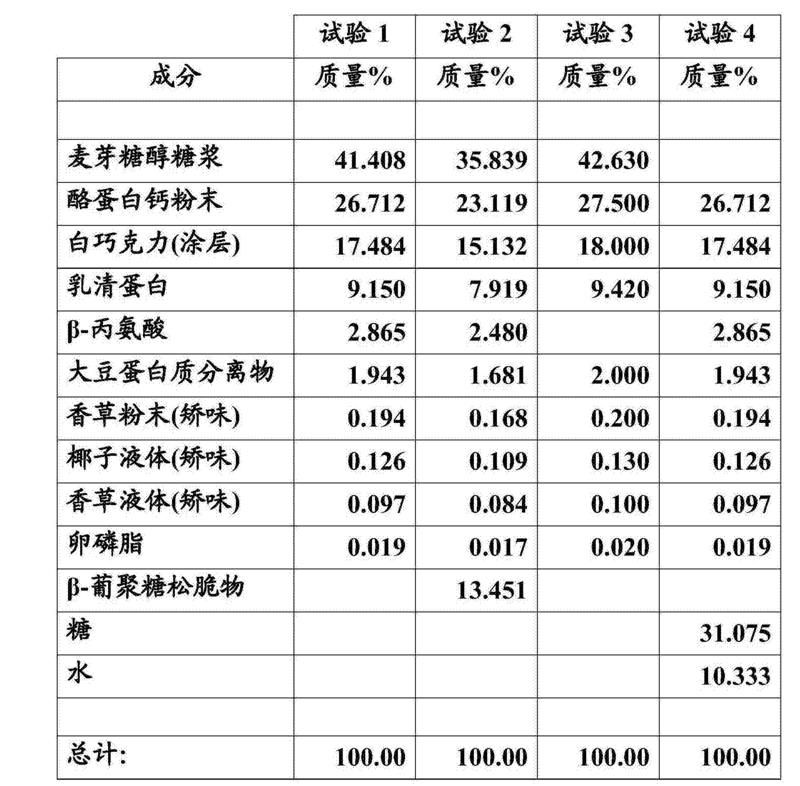 蛋白质棒配方的实例如下面的表3中所示。 Examples  protein bar formulations as shown in Table 3 below. 蛋白质棒中β_丙氨酸的定量证实了6个月后令人惊叹的低损失:对于具有麦芽糖醇糖浆粘合剂的变型而言，在20°C和30°C下分别具有99%和97%的β-丙氨酸回收率，对于具有蔗糖粘合剂的变型而言，分别具有96%和92%的回收率。  Protein rod β_ alanine quantitatively confirmed stunning low loss after six months: with respect to variations in terms of adhesive maltitol syrup, at 20 ° C and 30 ° C respectively 99% and 97% of the β- alanine recovery of sucrose with respect to variations in terms of adhesive, respectively, 96% and 92% recovery. 对于含有β-葡聚糖类化合物的棒而目损失更尚：在20°C和30°C下分别具有80%和75%的回收率，如图9中所不，其显不了含有麦芽糖醇/蔗糖糖浆作为粘合剂且具有低含量的乳糖蛋白质成分的蛋白质棒的平均丙氨酸百分比回收率。 For rod-containing compound being β- glucans mesh still more losses: at 20 ° C and 30 ° C were 80% and 75% recovery, is not depicted in Figure 9, which is substantially not containing maltitol / sugar syrup as a binder component and having a low content of lactose protein protein bars had an average percent recovery alanine. 此外还发现具有β_葡聚糖类化合物的变型中所含有的β_葡聚糖松脆物有点硬，可以用其它类型的松脆物(例如"高纤维麸糠秸杆"）替代。  Also found β_ glucan crisps variant has β_ glucans contained in bit hard, may be used other types of crisps (e.g., "high fiber bran, straw") instead. 来自申请人先前进行的人研究的试验结果显示，与溶液相比，在蛋白质型基质中尿肌酸排泄(例如损失)减少。  The results from applicants who previously conducted study showed, compared with the solution, a matrix type of urinary protein excretion of creatine (e.g., loss) decrease. 另外，白巧克力小片(chips)中包囊β-丙氨酸显示出了有前景的结果(例如无褐变）。 Further, white chocolate pieces (Chips) are encapsulated β- alanine showed promising results (e.g., no browning). 然后将这些小片加入到蛋白质棒中。 These small pieces were then added to the protein rod. 作为棒的一种替代选择，申请人还制备并分析了具有β-丙氨酸的即饮型（"RTD"） 形式。  As an alternative to the rod, the Applicant was also prepared and analyzed ready to drink ( "RTD") having the form of β- alanine. 使用目前可获得的产品Clinutren/Resource水果。 The use of currently available products Clinutren / Resource fruits. 在RTD形式中加入β-丙氨酸具有多种优点：（i)典型地可以在RTD形式中加入较高量的丙氨酸，因为该化合物在水中具有良好的溶解性，并且不影响味道；（ii)由于饮料的酸度(pH~4)β-丙氨酸的稳定性增加;和（iii)目前可获得的产品具有有意义的营养组成， 其可以被进一步调节用于性能营养。  added in the form of β- alanine RTD has several advantages: (i) may typically be added in higher amounts alanine RTD form, because the compound has good solubility in water, and do not affect the taste; (ii) due to the acidity of the beverage (pH ~ 4) β- alanine increased stability; and (iii) the currently available product with significant nutritional composition, which may be used to further adjust the properties of nutrition . 制备了下面的原型：（i)具有1.6g0-丙氨酸/200ml的Clinutren水果；（ii)具有1 · 6g0-丙氨酸/400ml 的Cl inutren 水果;和（iii)具有5 · 7g 肌肽/200ml 的Cl inutren 水果(在被肝水解后递送1.6gi3-丙氨酸）。  The following prototype prepared: (i) having an alanine 1.6g0- / 200ml of fruit Clinutren; (ii) Cl 1 · 6g0- having alanine / 400ml of inutren fruit; and (iii) a 5- carnosine 7g / 200ml of Cl inutren fruit (after hydrolysis by hepatic delivery 1.6gi3- alanine). 还对肌肽进行了测试，因为其代谢更慢一些，从而提供了天然的更慢的释放。  Carnosine also tested, because their metabolism is slower, thus providing a natural slower release. 参见Harris等人，"口服给予的β-丙氨酸的吸收及其在人股外侧肌中对肌肉肌肽合成的影响9The absorption of orally supplied beta-alanine and its effect on muscle carnosine synthesis in human vastus lateralis]，'，Amino Acids，vol·30:279-289 (2006)。 See Harris et al., "Absorption of orally administered β- alanine and its impact on people in the vastus lateralis muscle carnosine synthesis 9The absorption of orally supplied beta-alanine and its effect on muscle carnosine synthesis in human vastus lateralis] , ', Amino Acids, vol · 30: ​​279-289 (2006). 为了评价β-丙氨酸在这类RTD组合物中的热稳定性，使原型经受延长的加热(例如80°C，1小时）。  In order to evaluate the thermal stability of β- alanine RTD in such compositions, so that the prototype is subjected to prolonged heating (e.g. 80 ° C, 1 hour). 对于具有1.6gi3-丙氨酸/200ml的饮料而言，没有观察到损失，对于具有3.2g 丙氨酸/200ml的饮料而言，仅观察到约6%的损失，如图10中所示。 For beverages having 1.6gi3- alanine / 200ml, the loss was not observed, for the beverage has an alanine 3.2g / 200ml is observed only about 6% of the losses, shown in Figure 10. 需要进行贮存试验的工厂试验以验证这些非常有前景的结果。 Factory test requires storage tests to verify these results are very promising. 最后，申请人还进行了安全性评价研究，得出结论："来自控制释放片的β-丙氨酸(初始荷载剂量3.2g/天持续4周，然后维持剂量1.6g/天持续4周，或者在8周期间1.6g/天的剂量)不改变所分析的任意一个安全性参数。  Finally, the Applicant has also conducted safety evaluation studies, concludes: "β- alanine from controlled release tablets (initial loading dose of 3.2g / day for 4 weeks, then a maintenance dose of 1.6g / day for 4 weeks or 1.6g / day dose) does not change any of the analyzed parameter during a security 8 weeks. 综上所述，申请人开发并分析了含有β-丙氨酸的多种产品形式的原型。  In summary, the applicant has developed a variety of products and analyzed forms contain β- alanine prototype. 所述多种产品形式包括麦型棒、蛋白质棒和营养RTD组合物。 The type of wheat variety of product forms including bars, protein bars, and RTD nutritional composition. 提供了确保这些产品中β-丙氨酸的可接受的稳定性的技术方案。 It provides a technical solution to ensure acceptable stability of these products β- alanine. 总之，申请人发现试验结果令人惊讶地有益。 In short, the applicant has found that surprisingly beneficial results. 应当理解的是，对本领域的技术人员而言，对本文所述的本发明的优选实施方案的各种改变和调整都是显而易见的。  It should be understood that for those skilled in the art that various changes and modifications of the preferred embodiments of the invention described herein are obvious. 在不背离本发明的主题的精神和范围并且不消除其预期优点的情况下可以进行这类改变和调整。 Without departing from the spirit and scope of the subject matter of the present invention and does not abrogate its intended advantages such changes and modifications may be made. 因此，这类改变和修饰均被所附的权利要求书所涵盖。 It is therefore intended to cover such changes and modifications that are appended claims. 1. 固体食物产品，其包含： 至少一种固体成分来源，其选自β-葡聚糖类化合物、松脆物、锅巴、燕麦片、水果片及其组合;和至少一种在基本上不含任何还原糖的粘合剂中的反应性氨基酸。 A solid food product, comprising: at least one source of solid content, which is selected from β- glucans, crisps, crispy rice, rolled oats, fruit pieces and combinations thereof; and at least one substantially without any reducing saccharide containing reactive amino acid in a binder. 2. 根据权利要求1所述的固体食物产品，其中所述的反应性氨基酸选自丙氨酸、精氨酸、天冬酰胺、天冬氨酸、瓜氨酸、半胱氨酸、谷氨酸、谷氨酰胺、甘氨酸、组氨酸、羟脯氨酸、 羟丝氨酸、羟酪氨酸、羟赖氨酸、异亮氨酸、亮氨酸、赖氨酸、甲硫氨酸、苯丙氨酸、脯氨酸、丝氨酸、牛磺酸、苏氨酸、色氨酸、酪氨酸、缬氨酸及其组合。 The solid food product according to claim 1, wherein said reactive amino acid is selected from alanine, arginine, asparagine, aspartic acid, citrulline, cysteine, glutamic acid, glutamine, glycine, histidine, hydroxyproline, hydroxylysine, serine, hydroxyproline, tyrosine, hydroxylysine, isoleucine, leucine, lysine, methionine, phenylpropyl histidine, proline, serine, taurine, threonine, tryptophan, tyrosine, valine, and combinations thereof. 3. 根据权利要求1所述的固体食物产品，其中所述的反应性氨基酸是β_丙氨酸。 The solid food product according to claim 1, wherein said reactive amino acid is alanine β_. 4. 根据权利要求1所述的固体食物产品，其中所述的反应性氨基酸是肌肽。 The solid according to claim 1, said food product, wherein said reactive amino acid is carnosine. 5. 根据权利要求1所述的固体食物产品，其中所述的固体成分包含至少一种β_葡聚糖。 5. The solid food product according to claim 1, wherein said solid component comprises at least one β_ dextran. 6. 根据权利要求1所述的固体食物产品，其中所述的固体食物产品在约12个月后具有良好的反应性氨基酸稳定性。 The solid food product according to claim 1, wherein said solid food product has good stability in reactive amino acid after about 12 months. 7. 根据权利要求1所述的固体食物产品，其中每份大小的固体食物棒包含约1. Og_约3.5g所述反应性氨基酸。 The solid food product according to claim 1, wherein each size of the solid food bar comprises about to about 1. Og_ 3.5g reactive amino acid. 8. 根据权利要求1所述的固体食物产品，其中所述的粘合剂主要由麦芽糖醇糖浆、蔗糖糖浆或麦芽糖醇和蔗糖糖浆共混物之一组成。 8. The solid food product according to claim 1, wherein said binder consists essentially of one of the maltitol syrup, sucrose syrup or maltitol and sucrose syrup blends thereof. 9. 根据权利要求1所述的固体食物产品，其进一步包含至少一种具有低含量还原糖的蛋白质来源。 9. The solid food product according to claim 1, further comprising at least one protein source having a low reducing sugar content. 10. 根据权利要求9所述的固体食物产品，其中所述的蛋白质来源选自基于动物的蛋白质来源、基于植物的蛋白质来源、基于乳品的蛋白质来源、人造蛋白质来源及其组合。 10. The solid food product according to claim 9, wherein said source of protein is selected based on animal protein sources, plant-based sources of protein, dairy-based sources of protein, an artificial protein source, and combinations thereof. 11. 根据权利要求9所述的固体食物产品，其中所述的蛋白质源包含低于约0.2%的乳糖。 11. The solid food product according to claim 9, wherein the protein source comprises less than about 0.2 percent lactose. 12. 根据权利要求9所述的固体食物产品，其中所述的蛋白质是以下物质中的至少一种:酪蛋白钙、乳清蛋白、大豆蛋白分离物、乳蛋白质、或其组合。 12. The solid food product according to claim 9, wherein said protein is at least one of the following substances: calcium caseinate, whey protein, soy protein isolate, milk protein, or a combination thereof. 13. 液体食物产品，其包含： 量为约1 .〇g-约l〇g反应性氨基酸/约l〇〇ml-约500ml液体的反应性氨基酸，其中所述的液体食物产品具有约3 -约5的pH，其中在将所述的液体食物产品在约70 °C -约90 °C的温度下加热约45分钟-约75分钟的时间期限后所述的液体食物产品具有良好的反应性氨基酸稳定性。 13. A liquid food product, comprising: an amount of from about 1 to about l〇g .〇g- reactive amino acid / about 500ml to about l〇〇ml- reactive amino acid liquid, wherein the liquid food product having about 3 - a pH of about 5, wherein at about 70 ° C in the liquid food product - for about 45 minutes at a temperature of about to 90 ° C - the period of time of about 75 minutes after the liquid food product has good reactivity amino acid stability. 14. 根据权利要求13所述的液体食物产品，其中所述的液体食物产品是即饮型组合物。 14. The liquid food product according to claim 13, wherein the liquid food product is a ready to drink composition. 15. 根据权利要求13所述的液体食物产品，其中所述的反应性氨基酸选自丙氨酸、精氨酸、天冬酰胺、天冬氨酸、瓜氨酸、半胱氨酸、谷氨酸、谷氨酰胺、甘氨酸、组氨酸、羟脯氨酸、 羟丝氨酸、羟酪氨酸、羟赖氨酸、异亮氨酸、亮氨酸、赖氨酸、甲硫氨酸、苯丙氨酸、脯氨酸、丝氨酸、牛磺酸、苏氨酸、色氨酸、酪氨酸、缬氨酸及其组合。 15. The liquid food product according to claim 13, wherein said reactive amino acid is selected from alanine, arginine, asparagine, aspartic acid, citrulline, cysteine, glutamic acid, glutamine, glycine, histidine, hydroxyproline, hydroxylysine, serine, hydroxyproline, tyrosine, hydroxylysine, isoleucine, leucine, lysine, methionine, phenylpropyl histidine, proline, serine, taurine, threonine, tryptophan, tyrosine, valine, and combinations thereof. 16. 根据权利要求13所述的液体食物产品，其中所述的反应性氨基酸是肌肽。 16. The liquid food product according to claim 13, wherein said reactive amino acid is carnosine. 17. 根据权利要求13所述的液体食物产品，其中所述的反应性氨基酸是β-丙氨酸。 17. The liquid food product according to claim 13, wherein said reactive amino acid is a β- alanine. 18. 制备具有改善的反应性氨基酸稳定性的固体食物产品的方法，该方法包括： 合并反应性氨基酸与基本上不含任何还原糖的粘合剂以形成粘合剂组合物;和混合所述的粘合剂组合物与选自β-葡聚糖类化合物、松脆物、锅巴、燕麦片、水果片及其组合的固体成分以制成具有改善的反应性氨基酸稳定性的固体食物产品。 18. A method of preparing a solid food product of improved stability of the reactive amino acid, the method comprising: combining with reactive amino acid substantially free of any reducing sugars adhesive to form an adhesive composition; and mixing said the adhesive composition is selected from β- glucans, crisps, crispy rice, rolled oats, fruit and combinations thereof, to form a solid component of the solid food product having improved stability of the reactive amino acids. 19. 根据权利要求15所述的方法，其中所述的固体食物产品选自权利要求1-权利要求12中请求保护的那些。 19. The method of claim 15, wherein said solid 1- claimed food product is selected from those claimed in claim in claim 12 claimed. 20. 改善液体食物产品中反应性氨基酸的稳定性的方法，该方法包括： 溶解约1 .〇g-约l〇g反应性氨基酸/约100ml-约500ml液体以制成具有改善的反应性氨基酸稳定性的液体食物广品； 将所述的液体食物产品在约70°C_约90°C的温度下加热约45分钟-约75分钟的时间期限;且其中所述的液体食物产品具有约3 -约5的pH。 20. A method for improving the stability of the liquid food product in the reactive amino acid, the method comprising: dissolving from about 1 to about l〇g .〇g- reactive amino acid / about 500ml to about 100ml- liquid is made to have an improved reactive amino acid stability wide liquid food products; the liquid food product was heated for about 45 minutes at a temperature of about 70 ° C_ about of 90 ° C - time period of about 75 minutes; and wherein the liquid food product having about 3 - pH of about 5. 21. 根据权利要求17所述的方法，其中所述的固体食物产品选自权利要求13-权利要求17中请求保护的那些。 21. A method according to claim 17, 13- claim wherein said solid food product is selected from those claimed in claim in claim 17 claimed. ES2373971T3 (en) 2012-02-10 nutritional composition with probiotics.